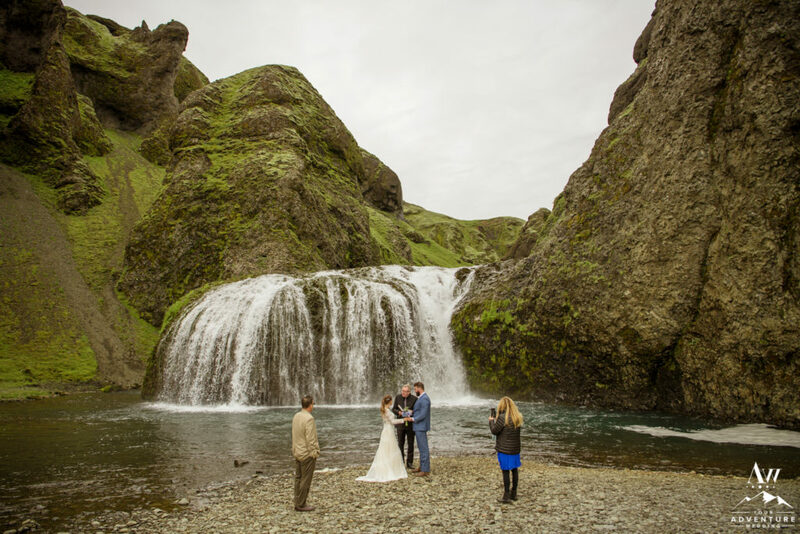 Love of travel is a common thread for the majority of our couples. 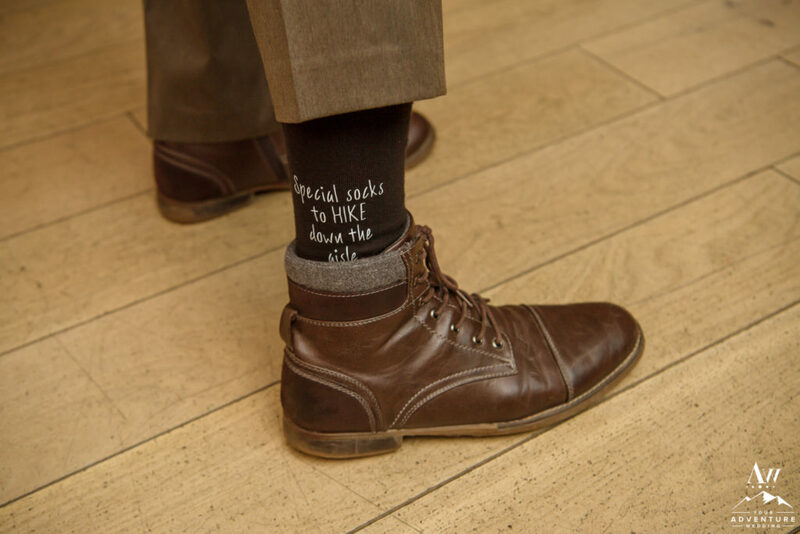 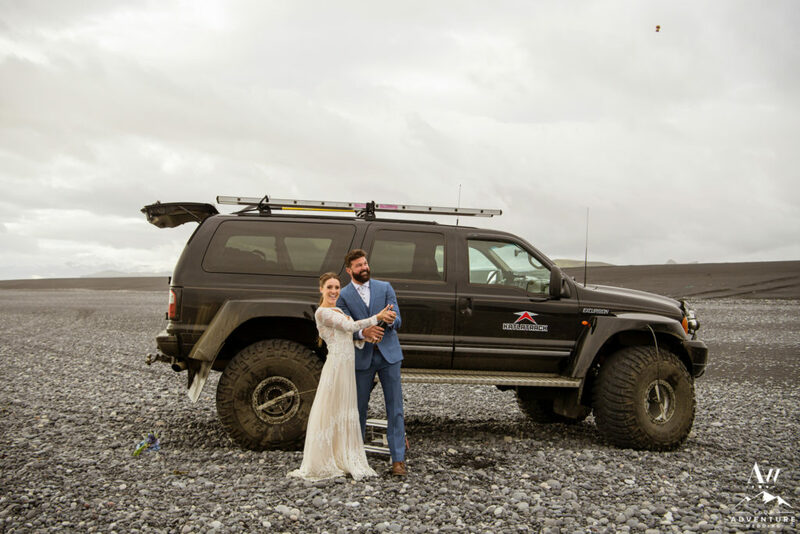 Likely the very reason it drives them to an adventure wedding! 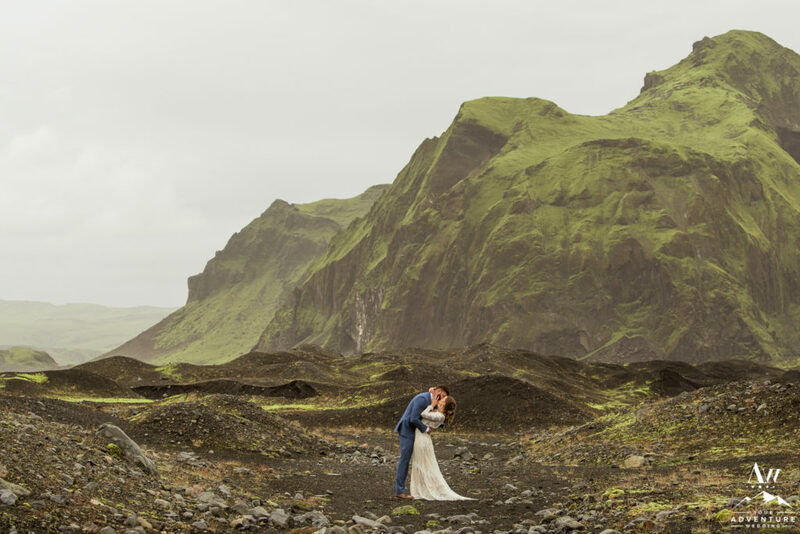 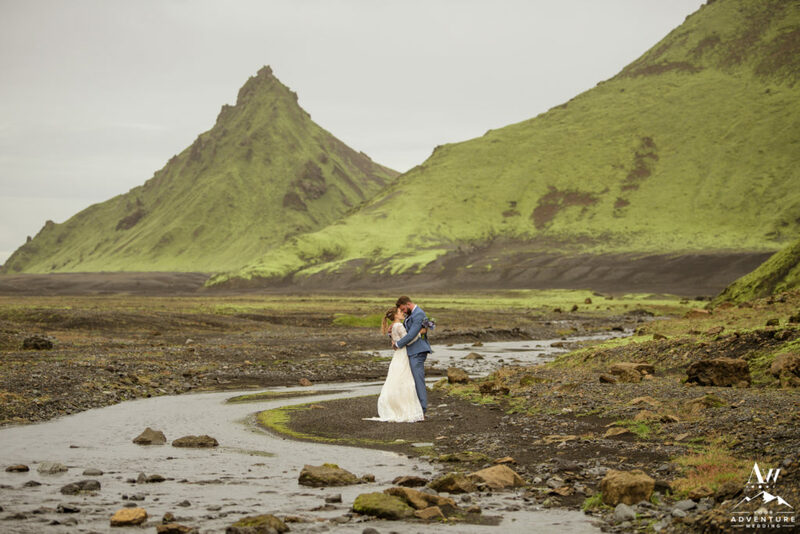 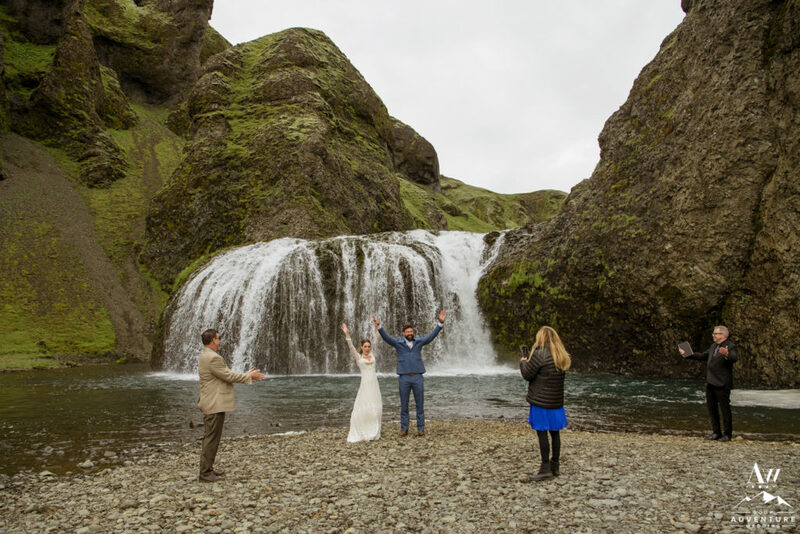 Amanda and Chad who are Florida natives, came to our Iceland Wedding Planner team seeking a waterfall elopement in Vik. 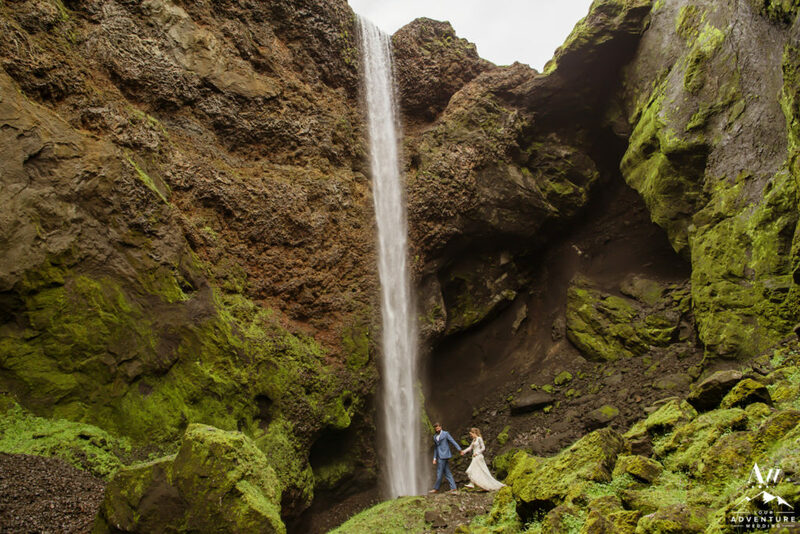 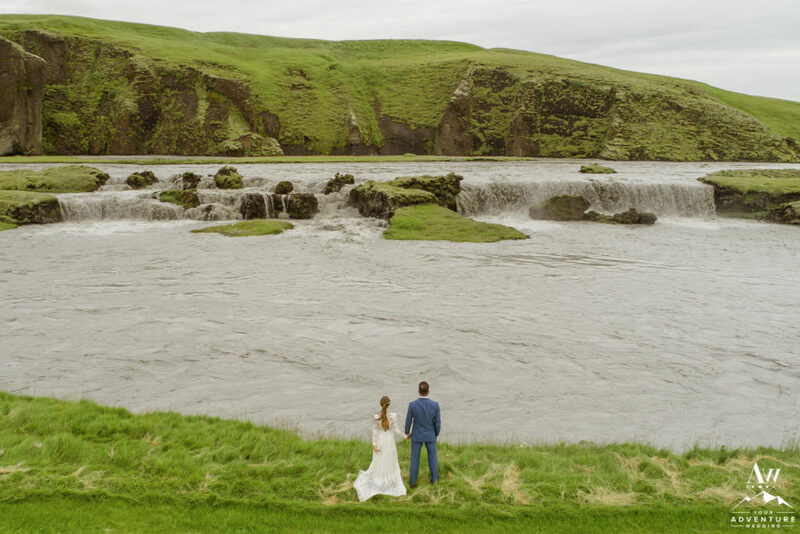 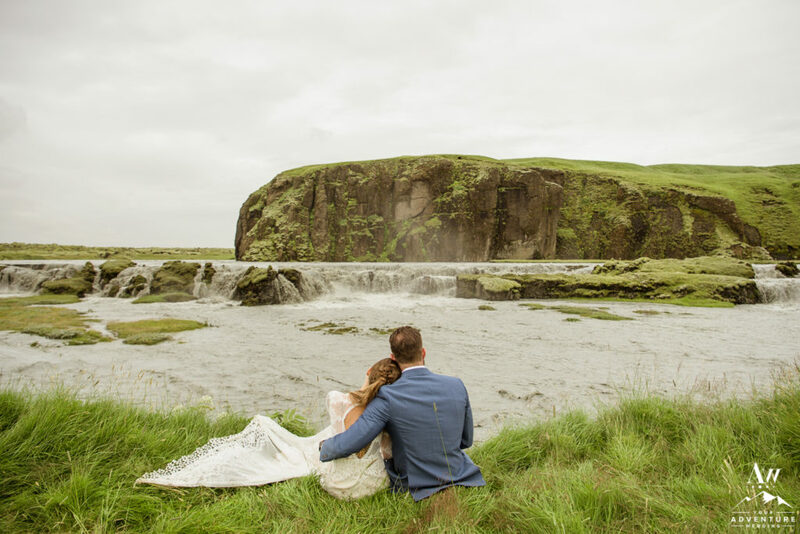 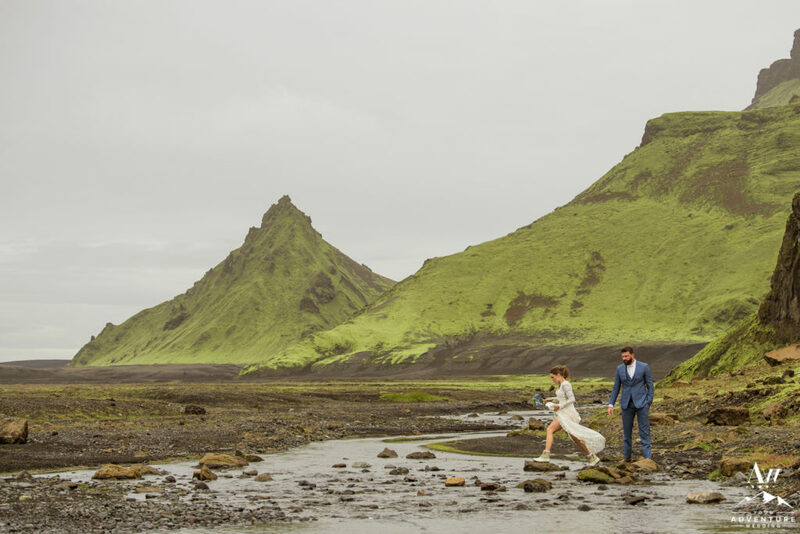 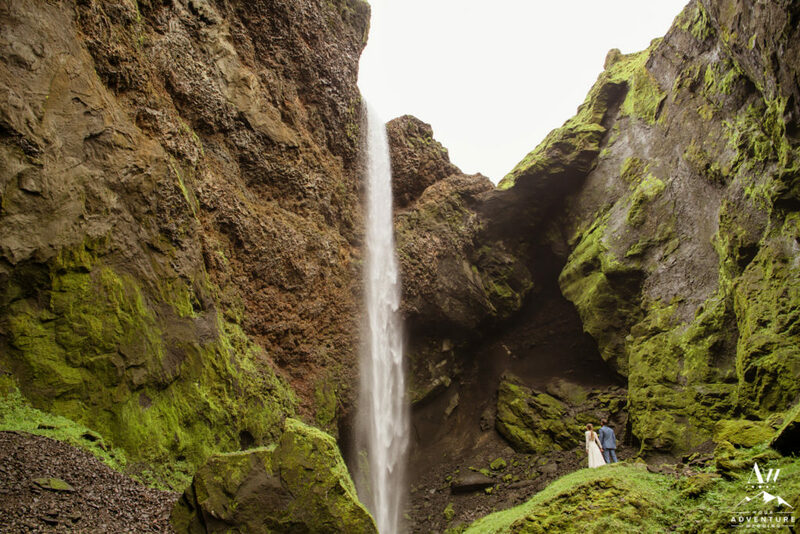 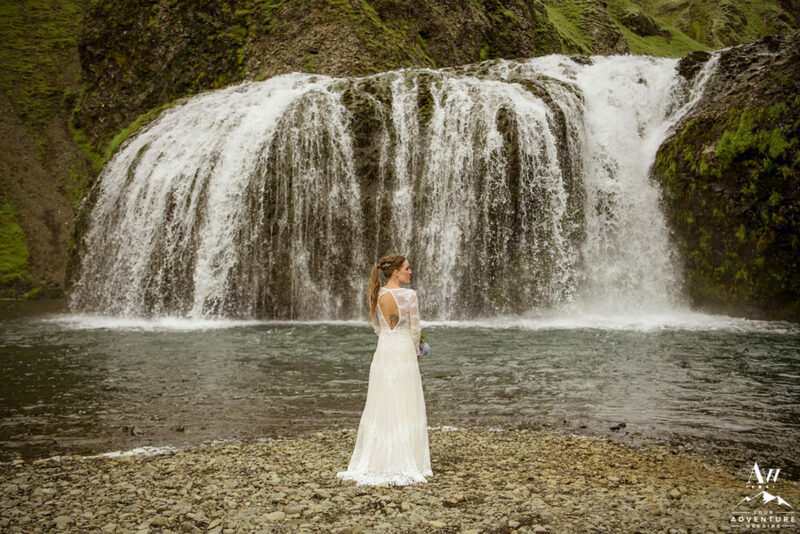 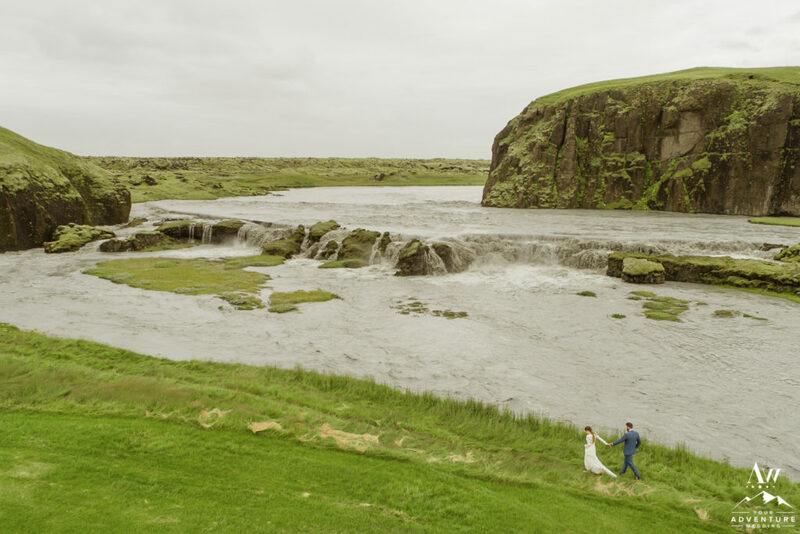 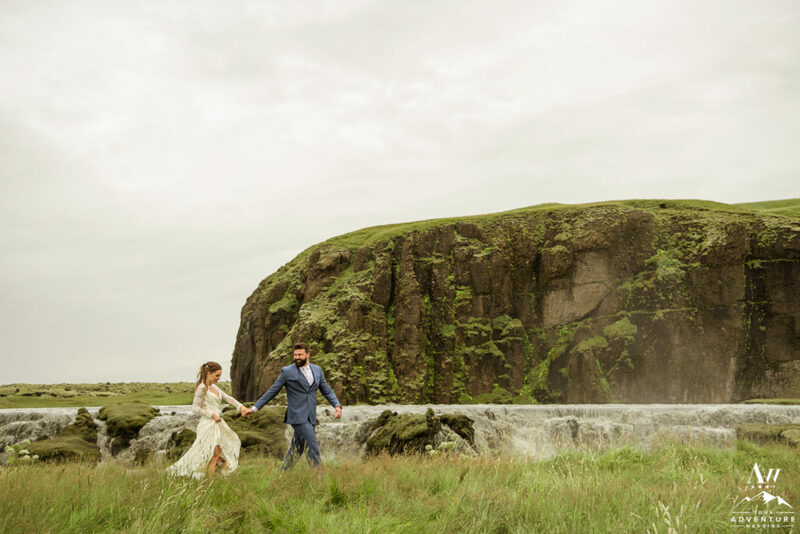 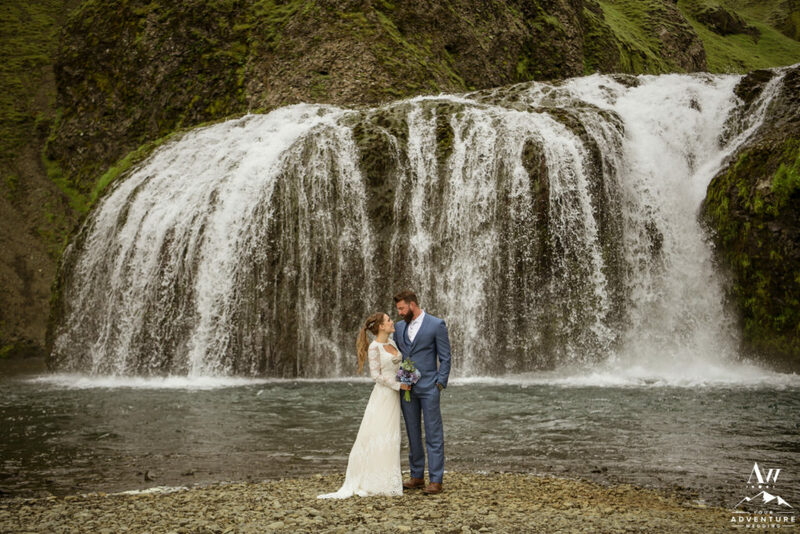 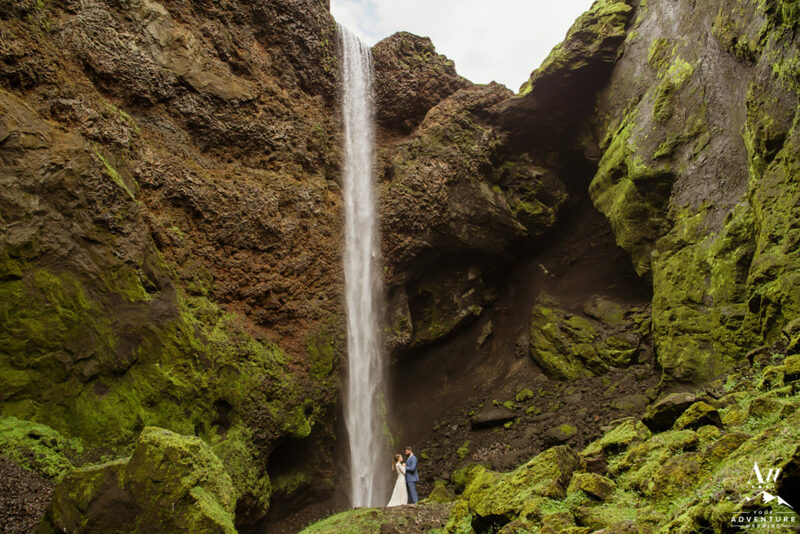 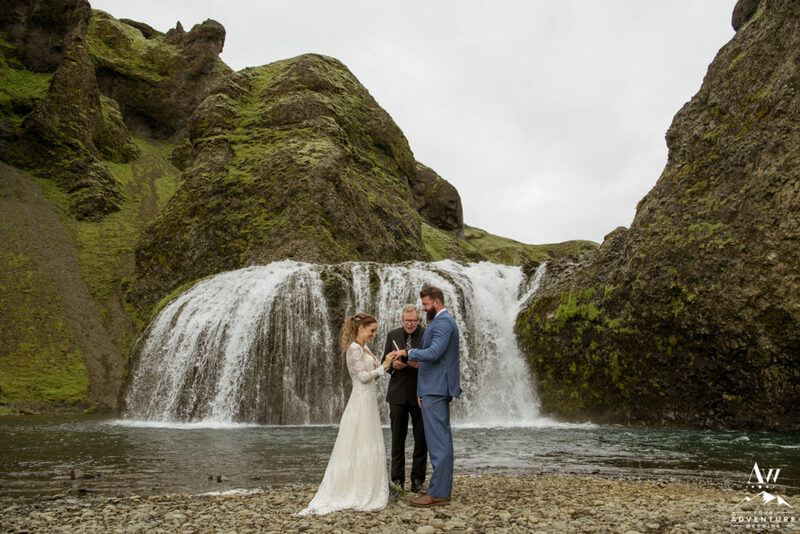 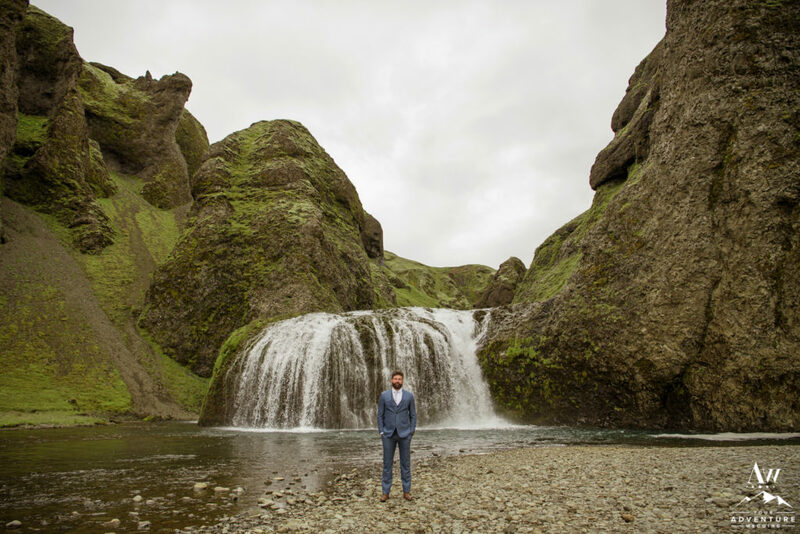 Originally seeking Skogafoss waterfall, we turned them on to way cooler and more private Iceland wedding locations. 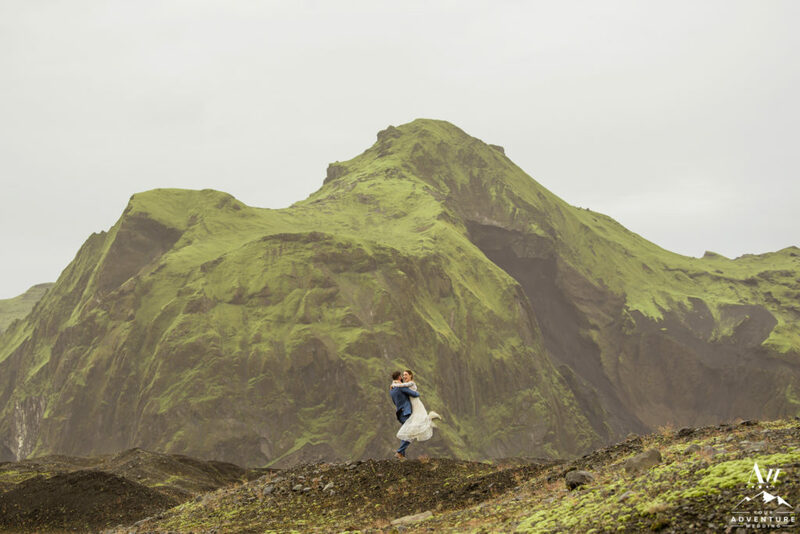 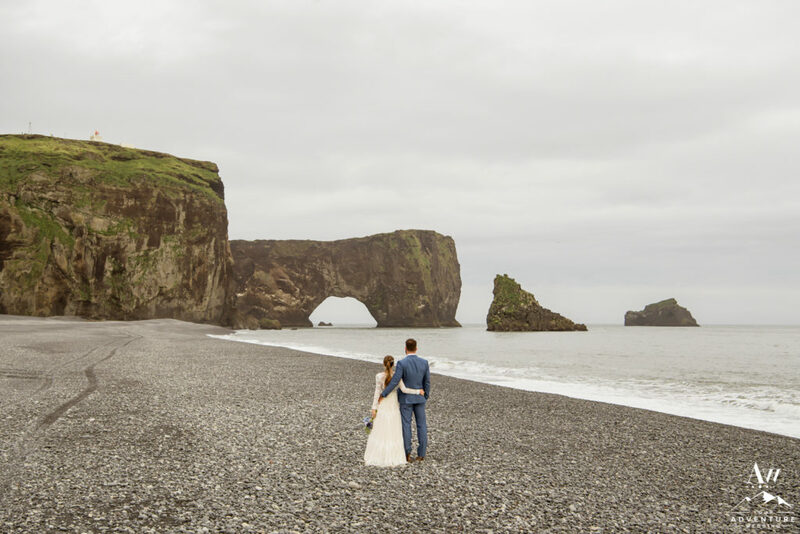 So follow us today as you experience their inspiring elopement in Vik along the South Coast of Iceland! 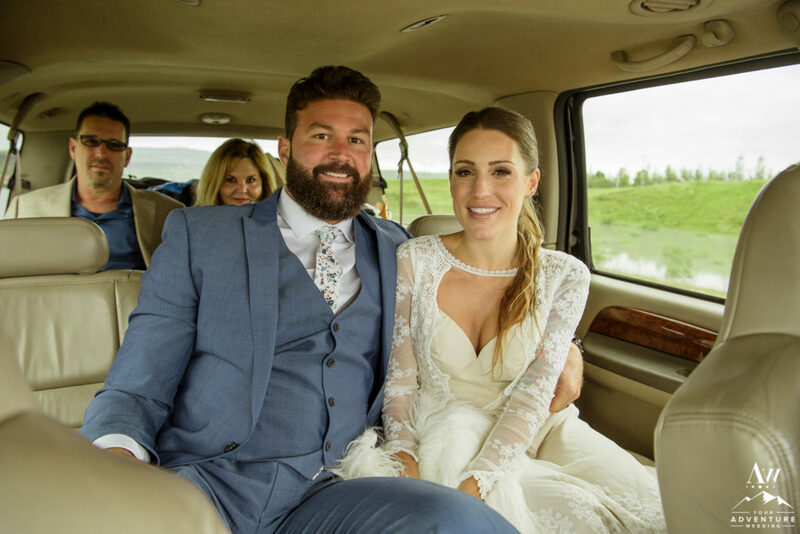 Being born and raised in the same hometown in Florida, Chad and Amanda found their way to each other in the spring of 2013. 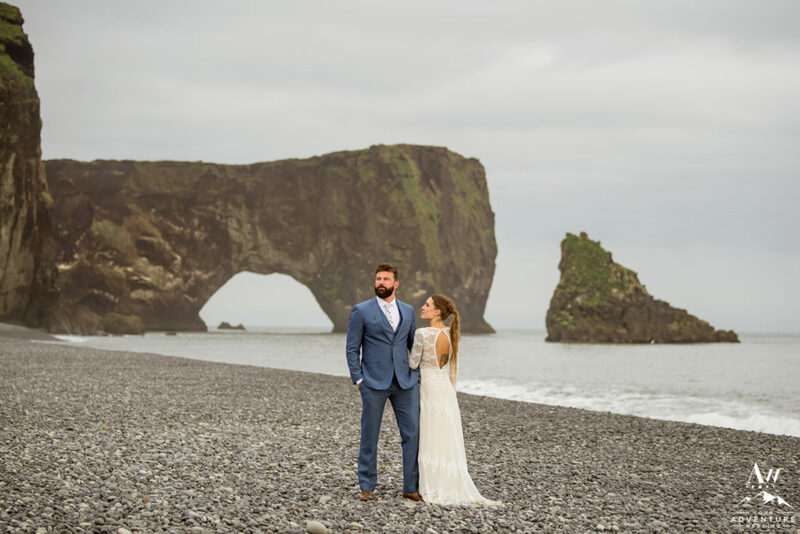 Their years together were filled with exploring new cities, snorkeling, swimming with sharks, buying a house, moving across the country, and love being outdoors rain or shine! 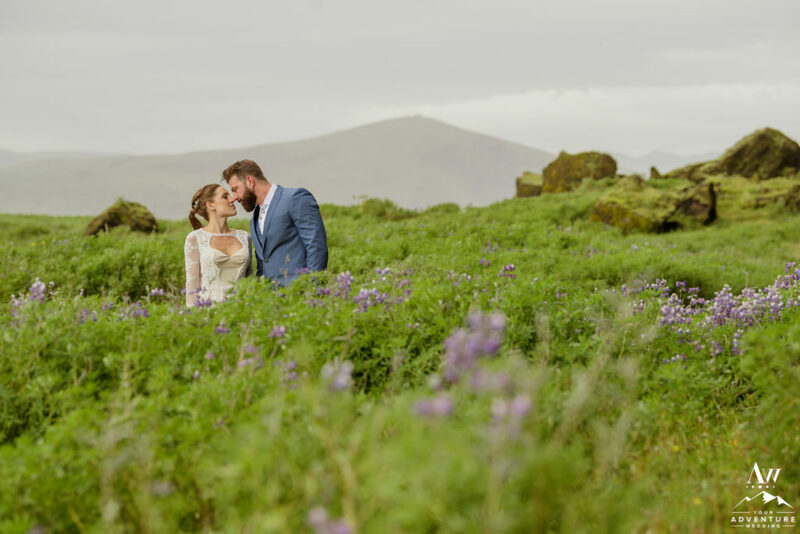 In 2016, they took a trip adventuring down the PCH (Pacific Coast Highway) and stopped to spend time in Napa Valley. Chad planned a romantic hot air balloon ride and proposed to Amanda during that adventure! 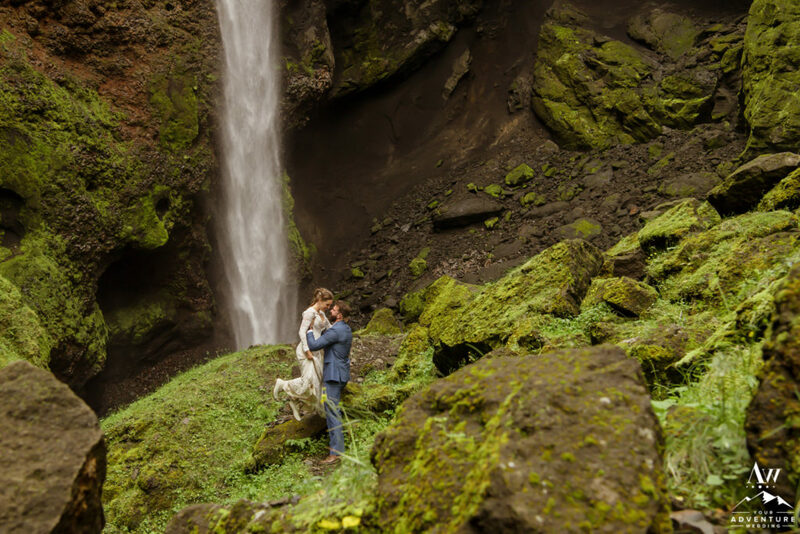 Shortly after their Napa Valley hot air balloon proposal, they began talking about where and how they would be married. 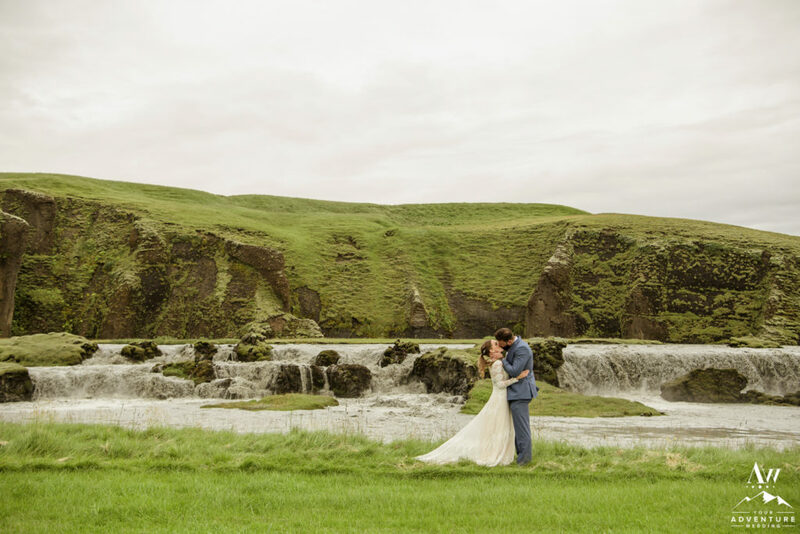 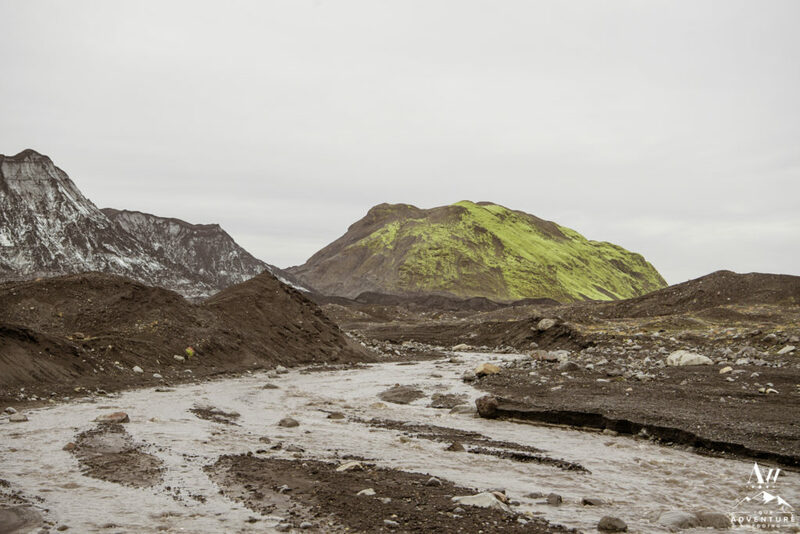 Both Amanda and Chad had always wanted to visit Iceland so it made perfect sense to combine the two! 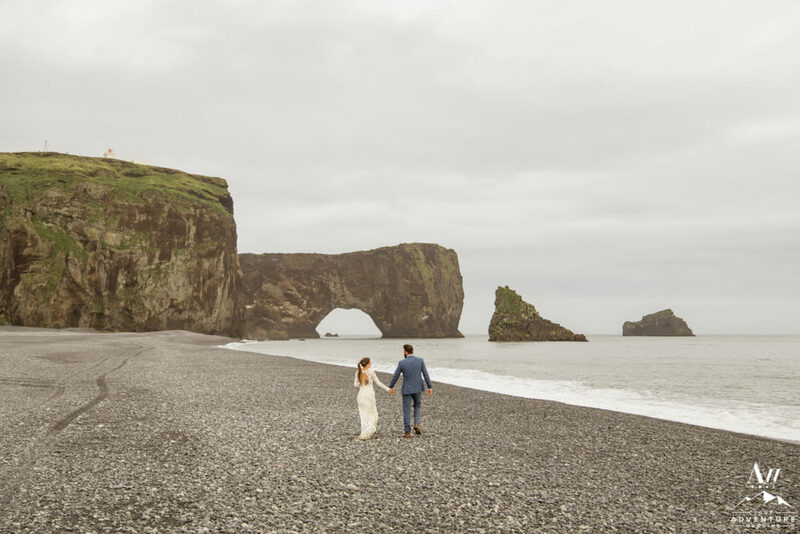 But not being super excited about running around in the snow, they decided holding an elopement in Vik in the month of August would be the best fit for them. 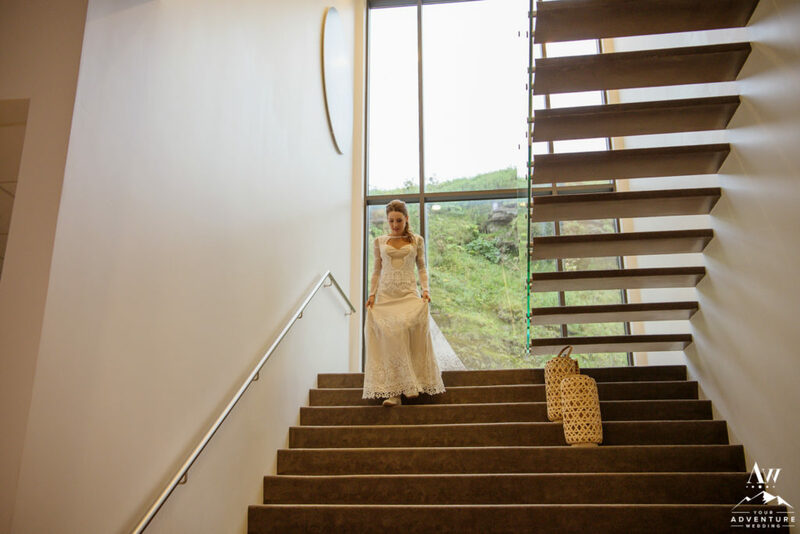 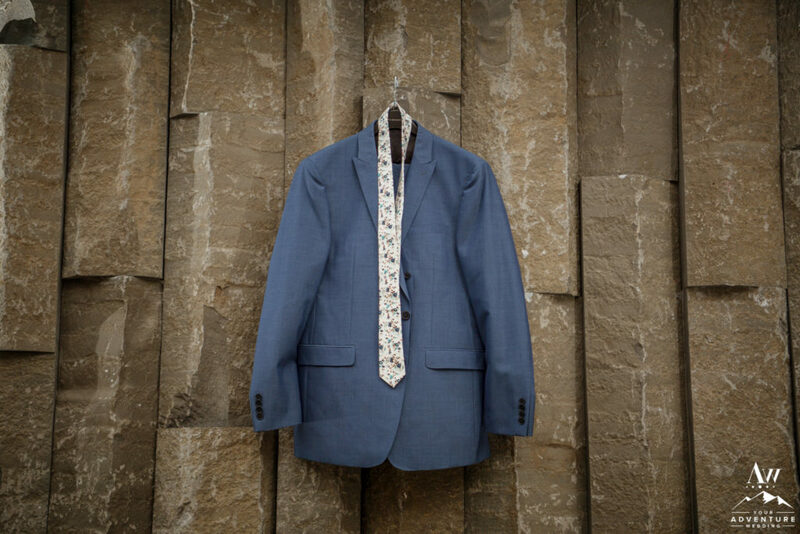 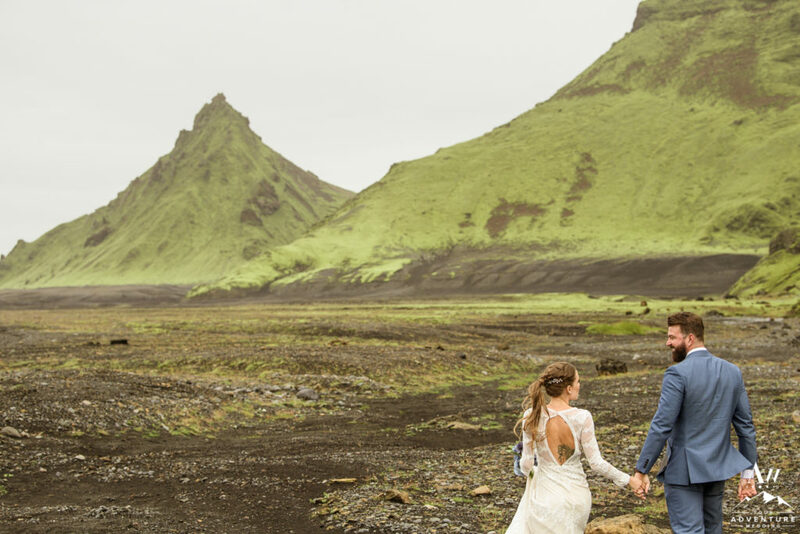 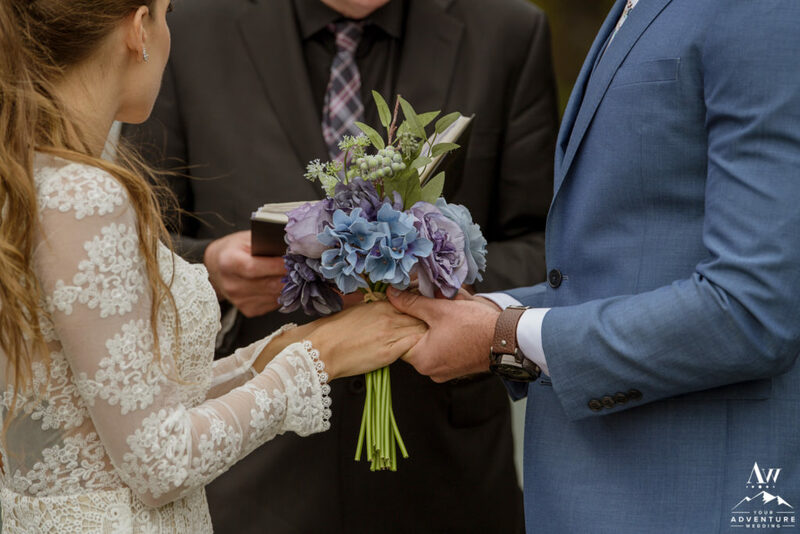 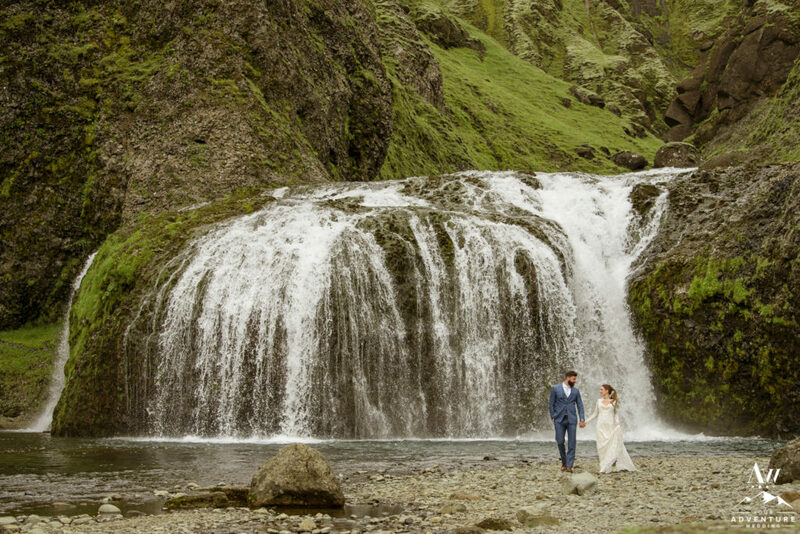 August is one of the best months to get married in Iceland. 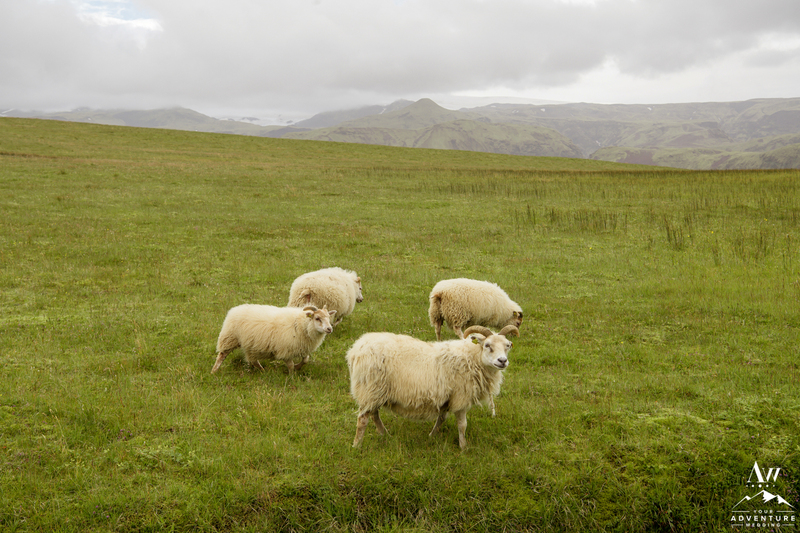 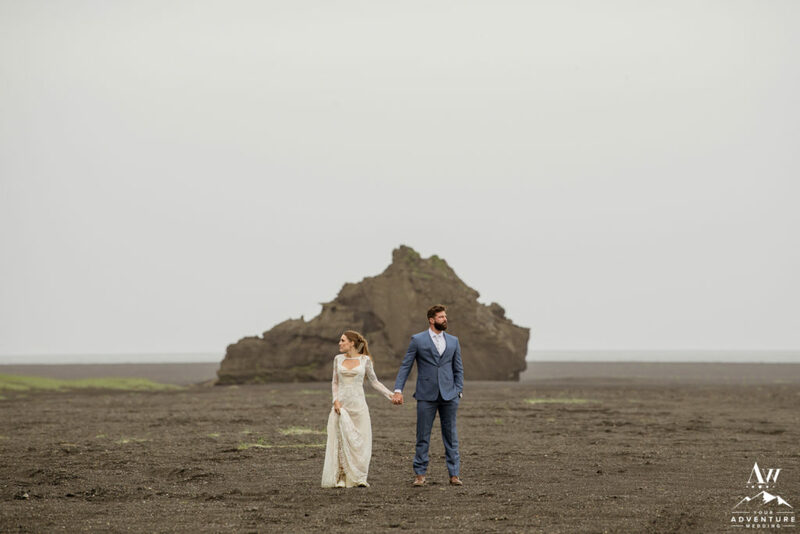 There is a lot of thought that goes into our Iceland wedding planning process. 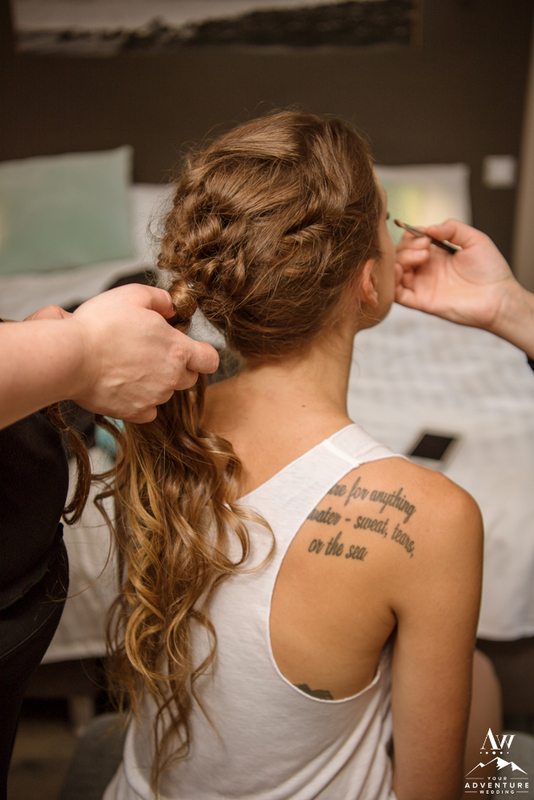 Our team carefully crafts many hour by hour amazing schedules for our clients. 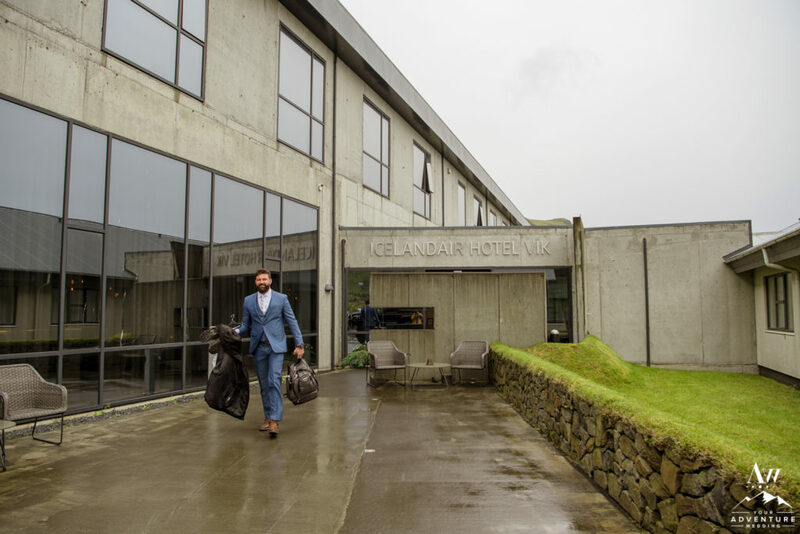 Each is paired with a hotel which upholds an American style standard and also ensures we keep our drive time low and experience factor high. 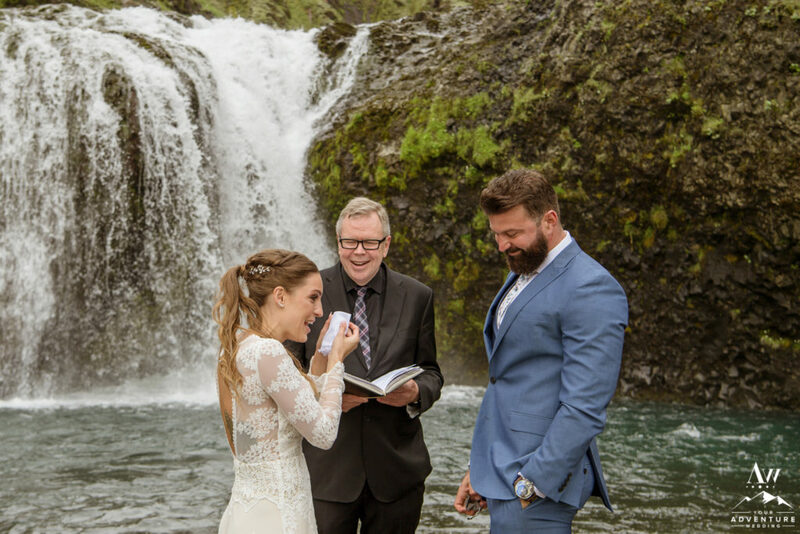 When Amanda and Chad perused through their exclusive options, they found a one they fell in love with. 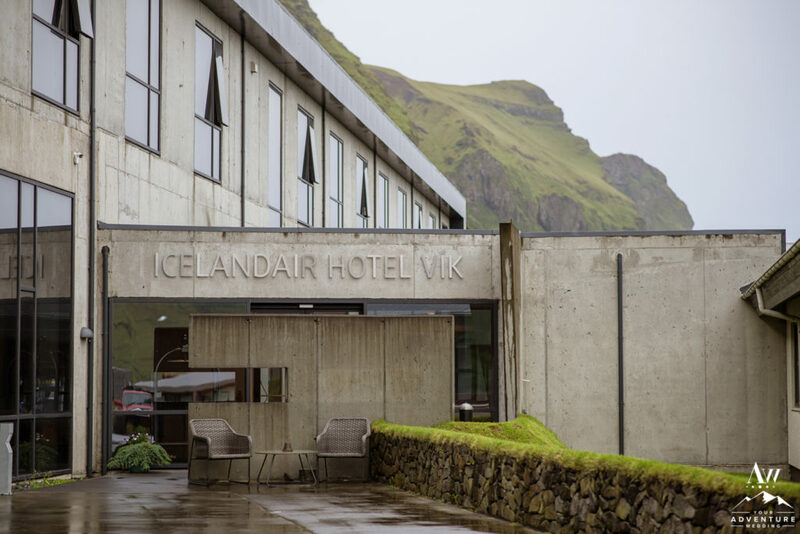 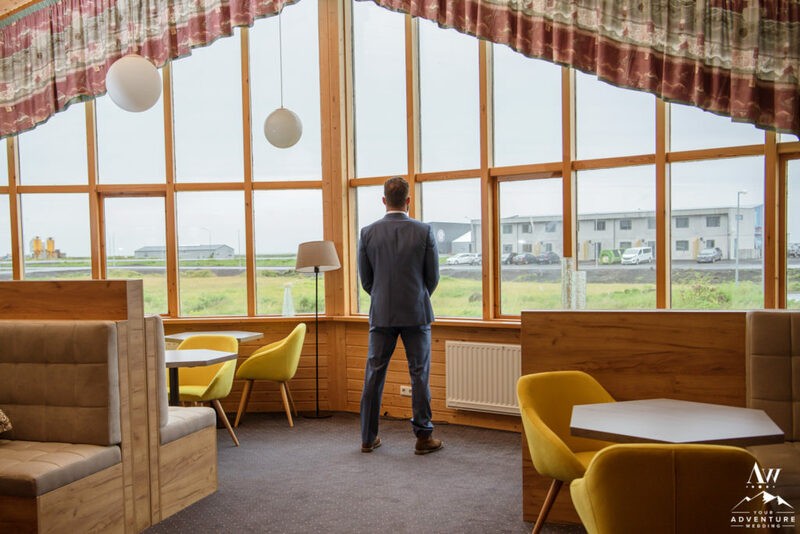 The base of that schedule was one of our favorite hotels, Icelandair Vik. 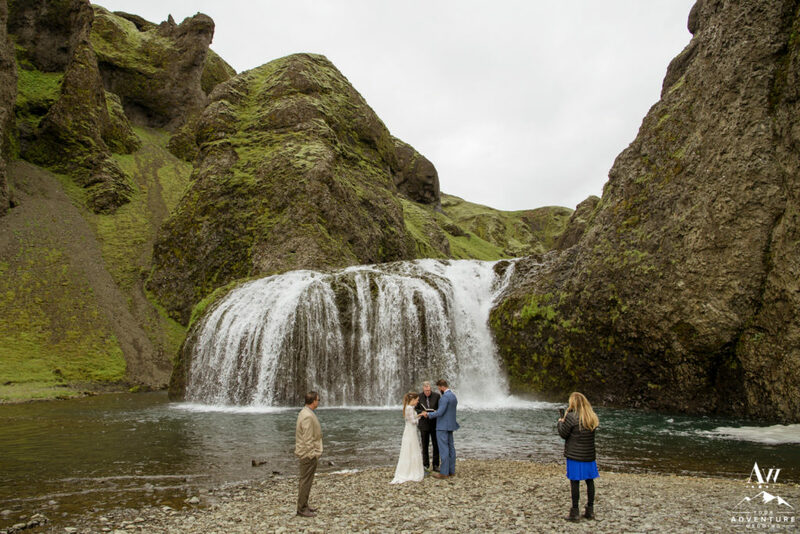 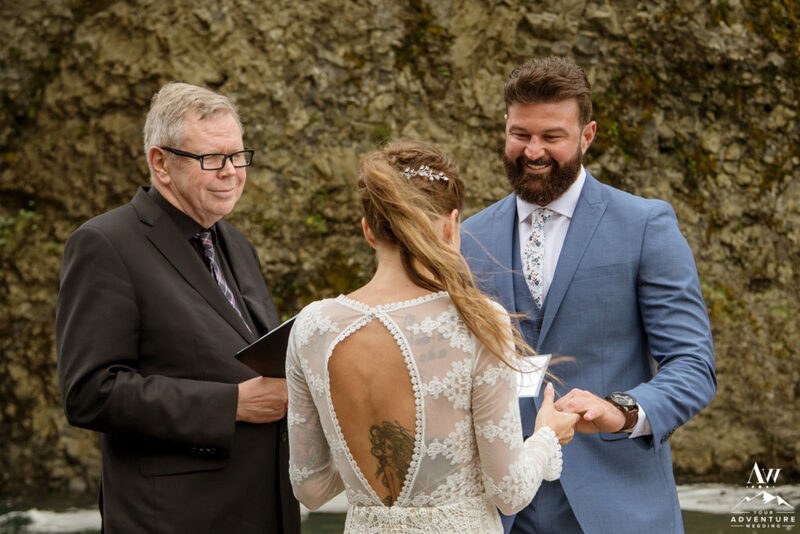 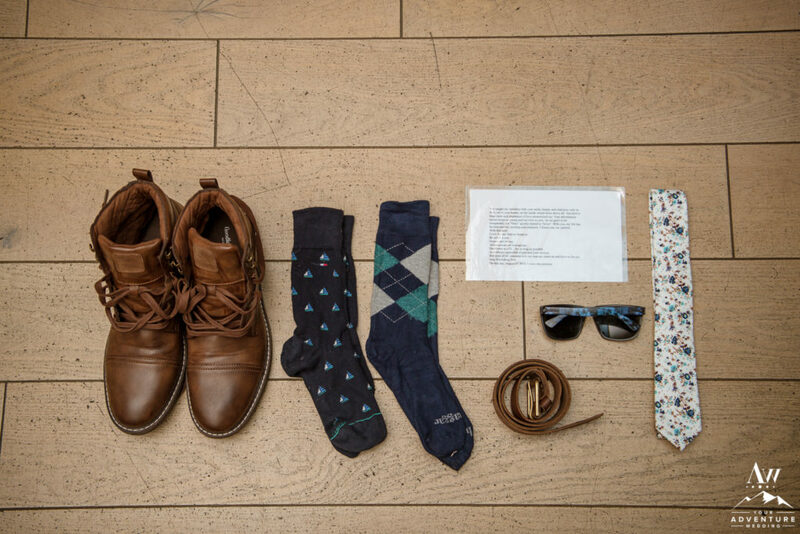 Closer to the day, Chad and Amanda decided to turn their elopement in Vik into an intimate wedding with 2 of their favorite people joining them. 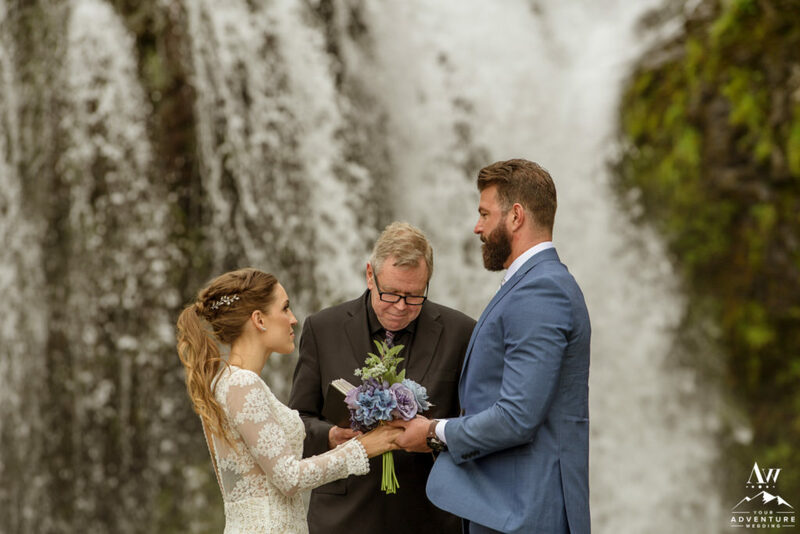 Amanda had her father join her side and Chad had his mother come to witness. 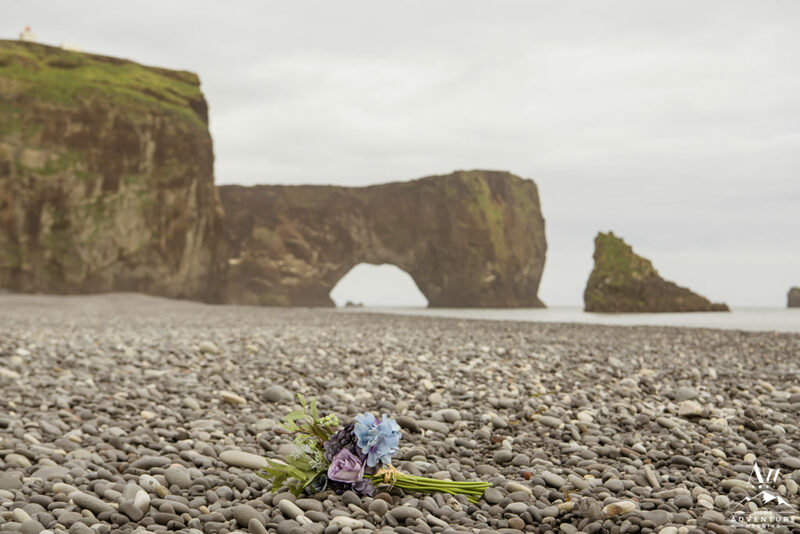 As the early morning came, these two lovers parted ways. 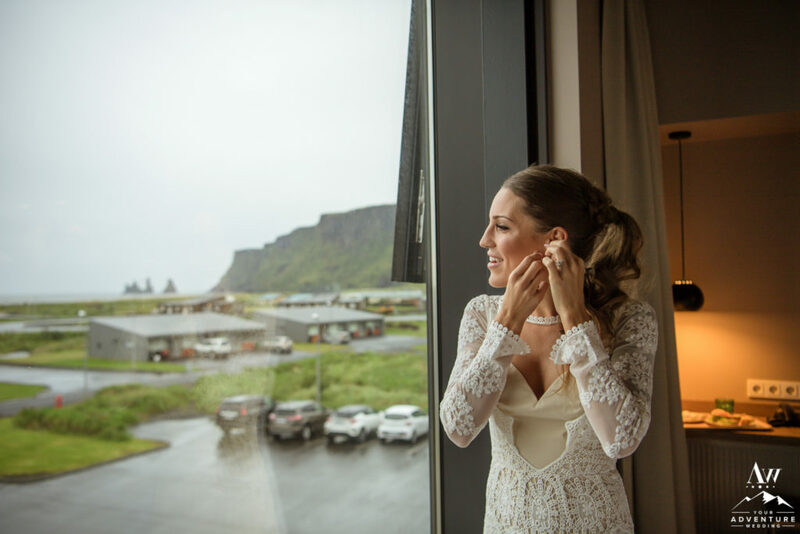 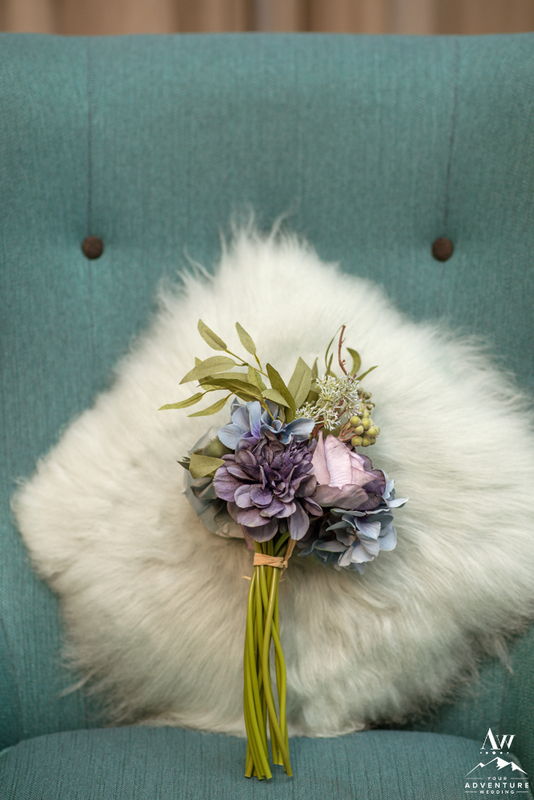 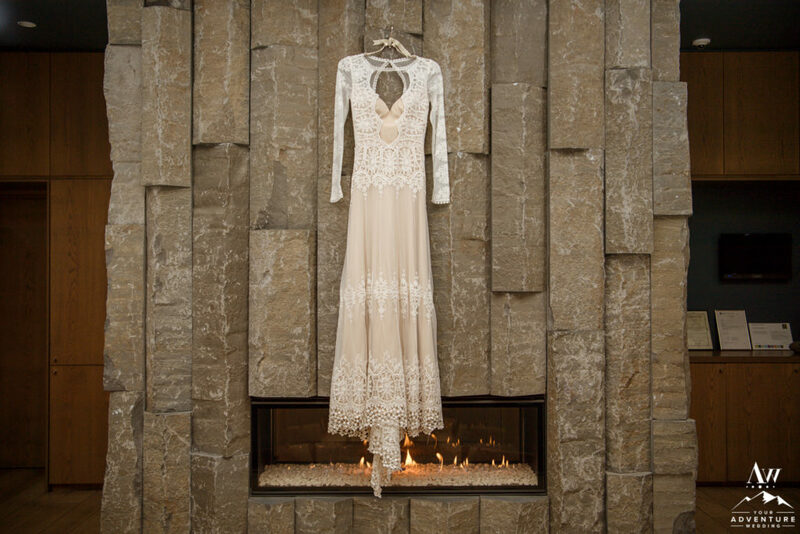 Our hair stylist, makeup artist, and Iceland wedding photographer came in to get the bride ready and photograph their lovely little details. 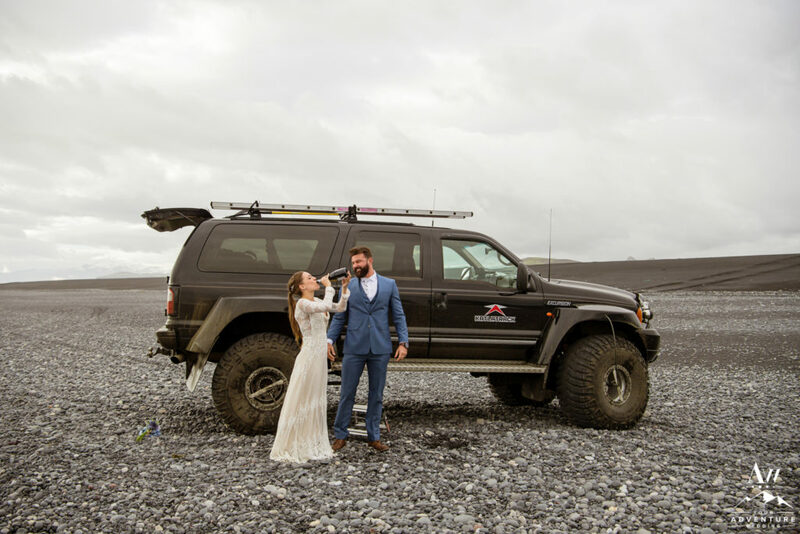 Before they loaded into the super jeep for the day, it was important to Amanda to have a first look with Chad. 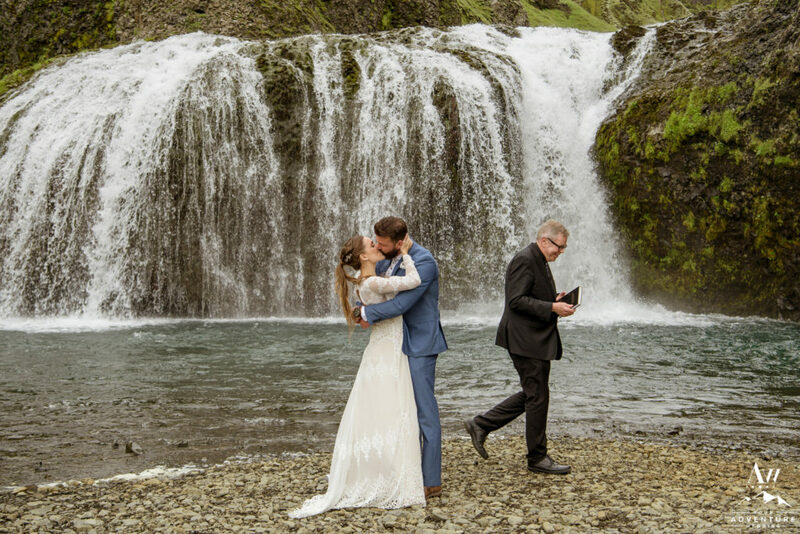 It was super sweet too as her father escorted her! 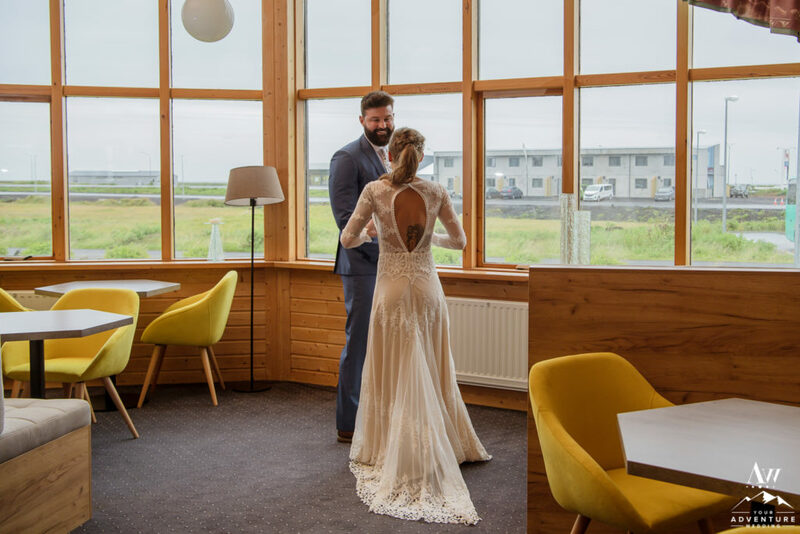 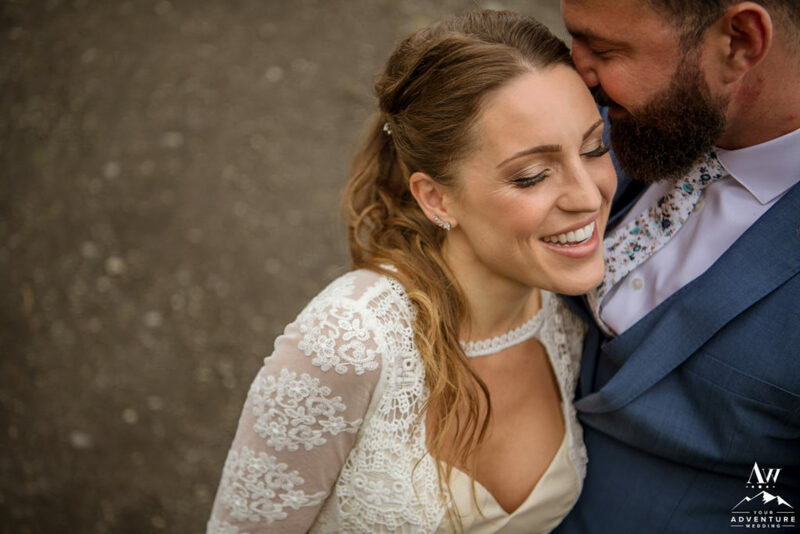 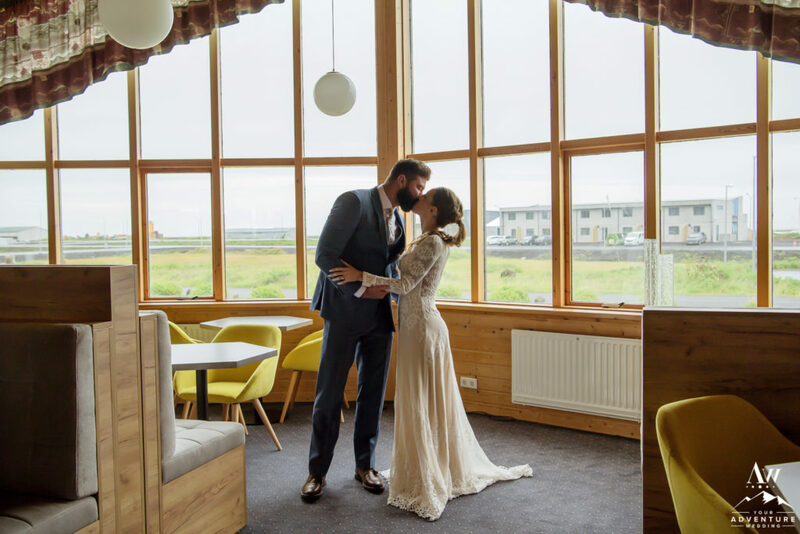 Sometimes it’s nice to have that sweet quite moment between the two of you before embarking on the full day adventure wedding in Iceland! 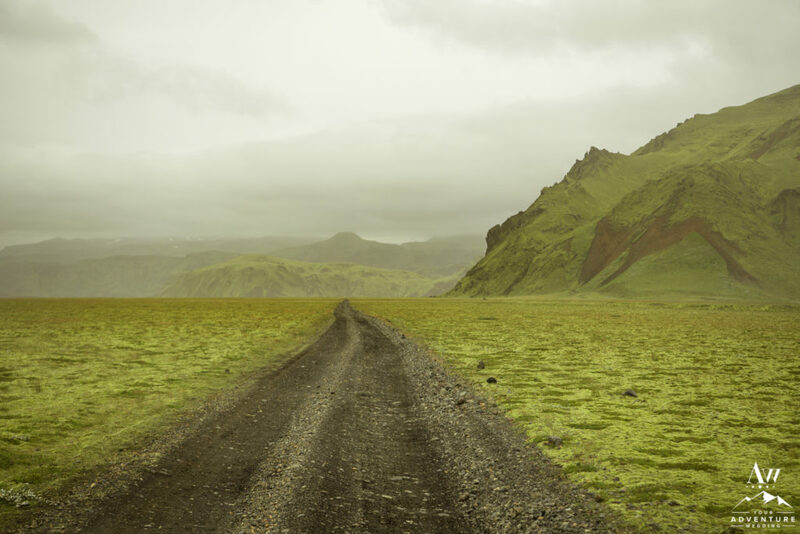 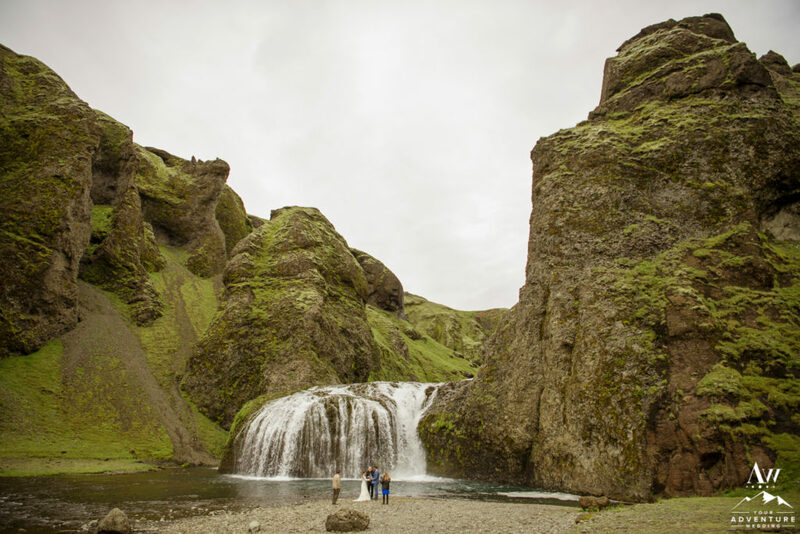 Iceland continues to awe and inspire even those of us who leave here! 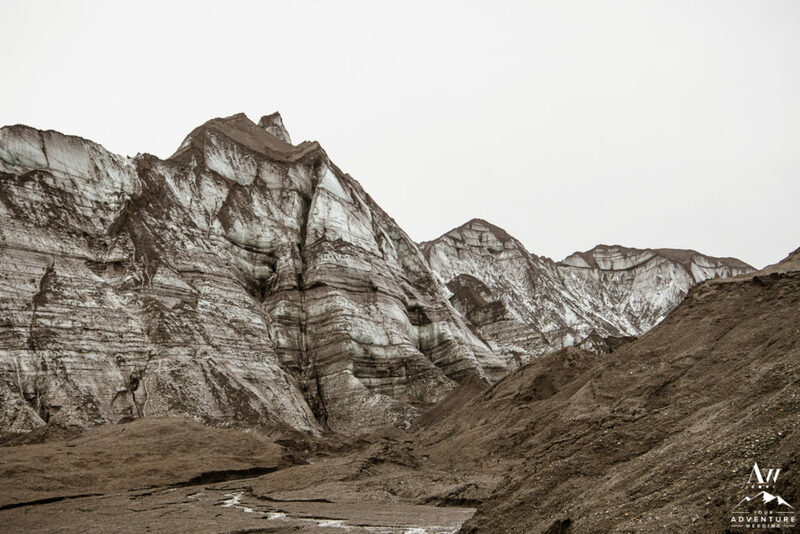 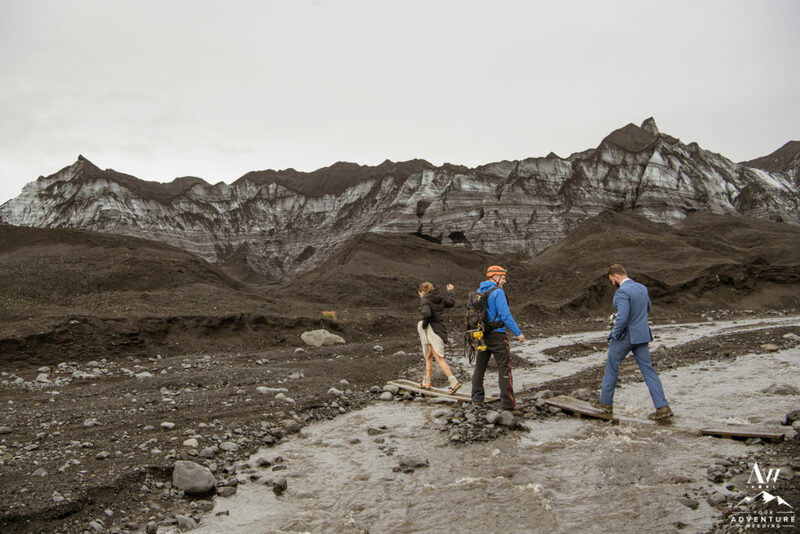 One of the most surprising things that can happen is when a sub-glacial volcano has activity. 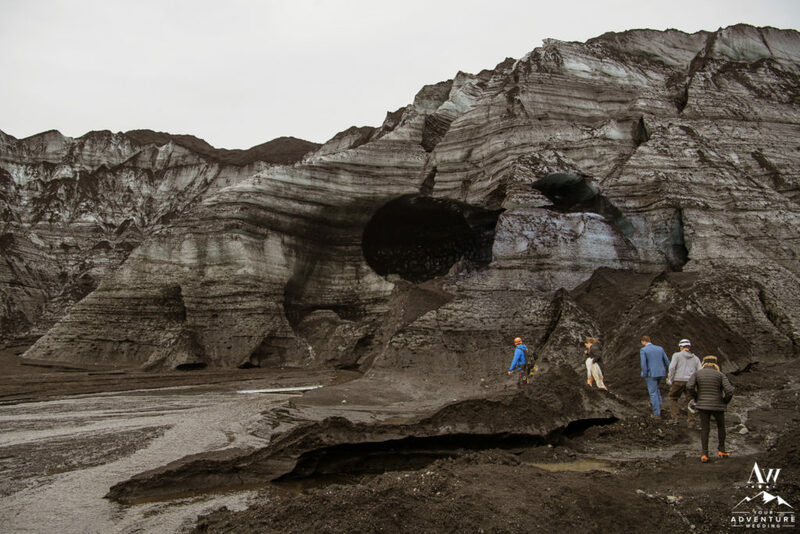 Typically it means that the glacier rivers swell. 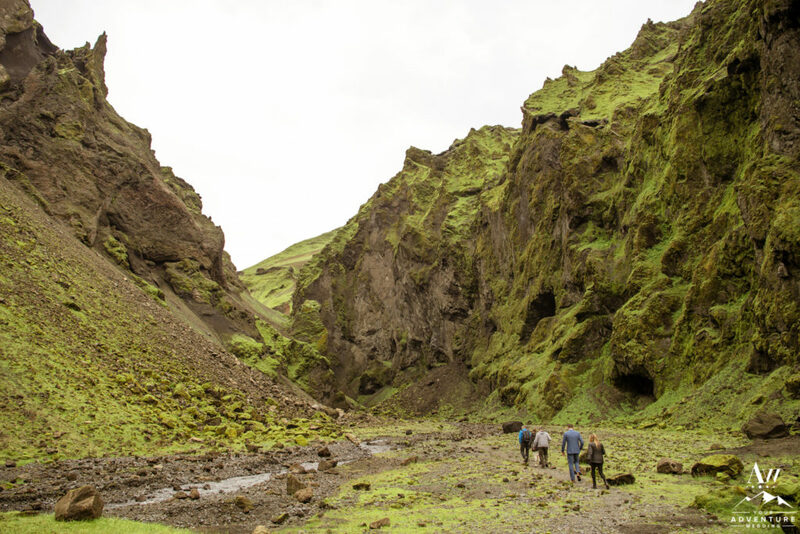 And by swelling, the water not only comes from the rivers, but also through moss, cracks, and lava rocks beside the roads. 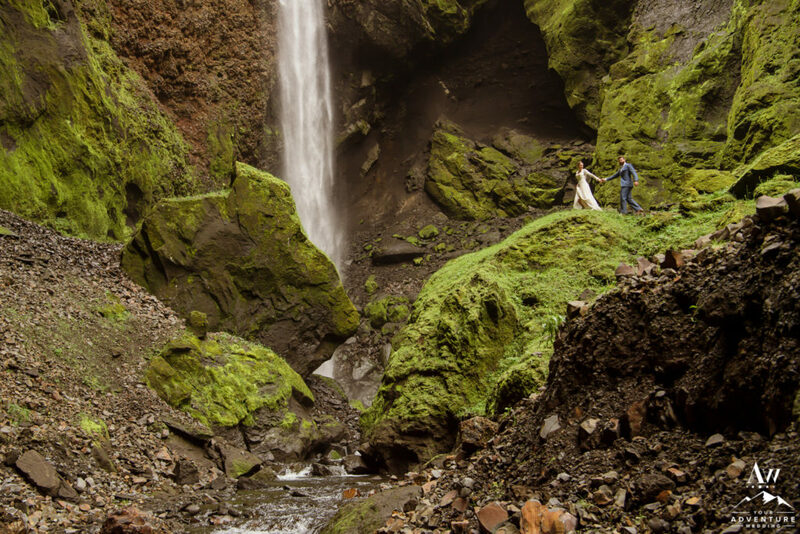 Crazy sight to see! 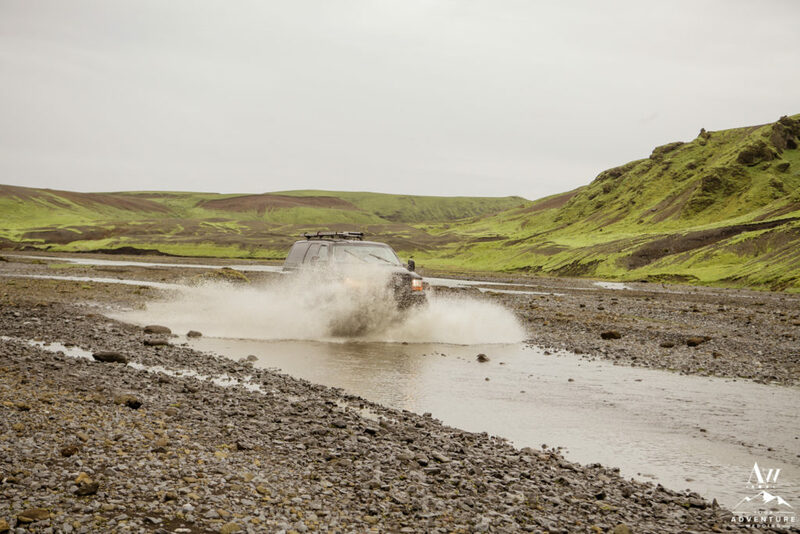 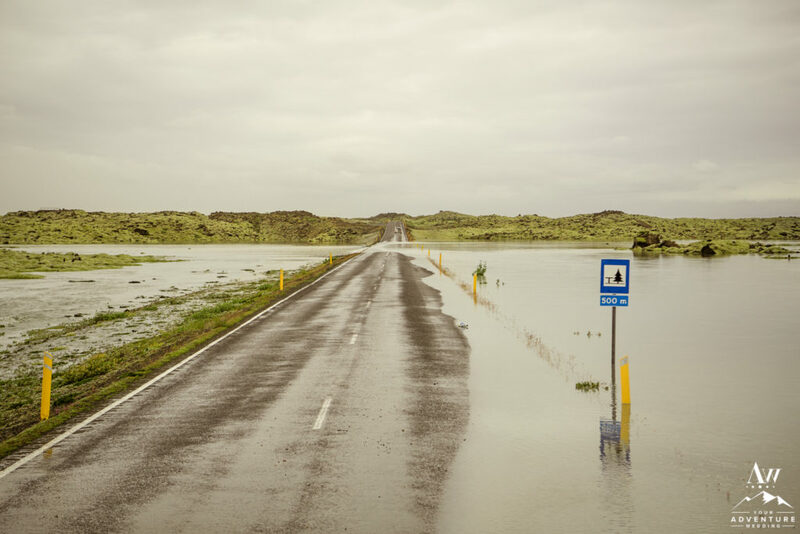 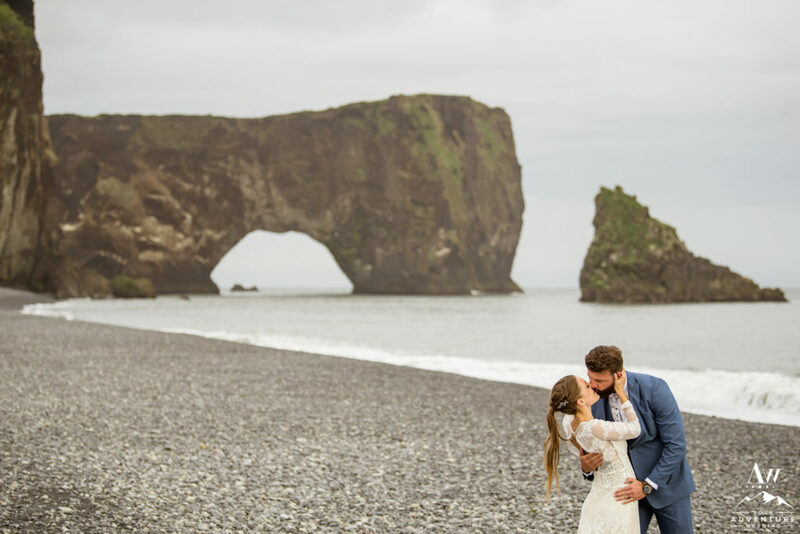 The day in August, Amanda and Chad decided to hold their elopement in Vik Iceland, the glacier rivers were flooding the roads. 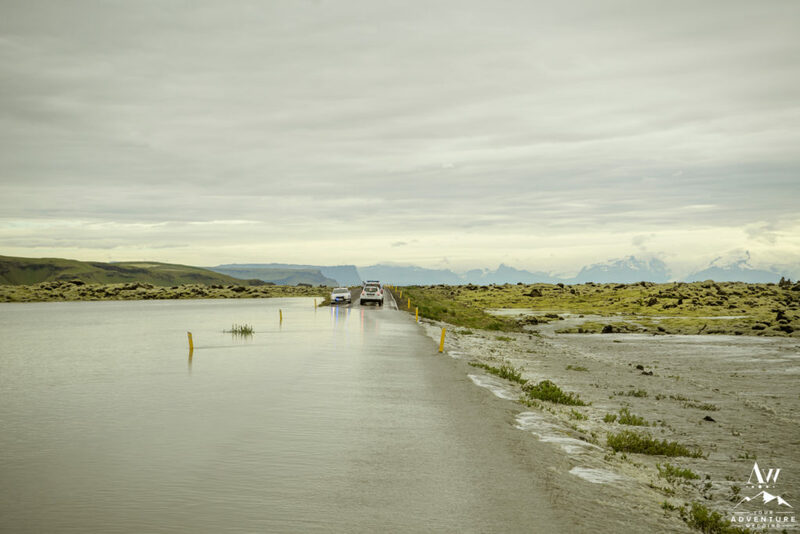 Luckily our super jeep team made it through before they closed the road. 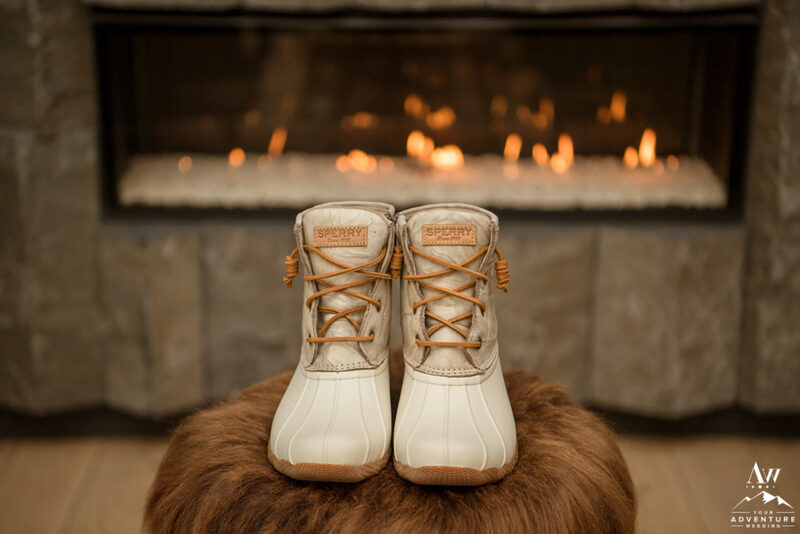 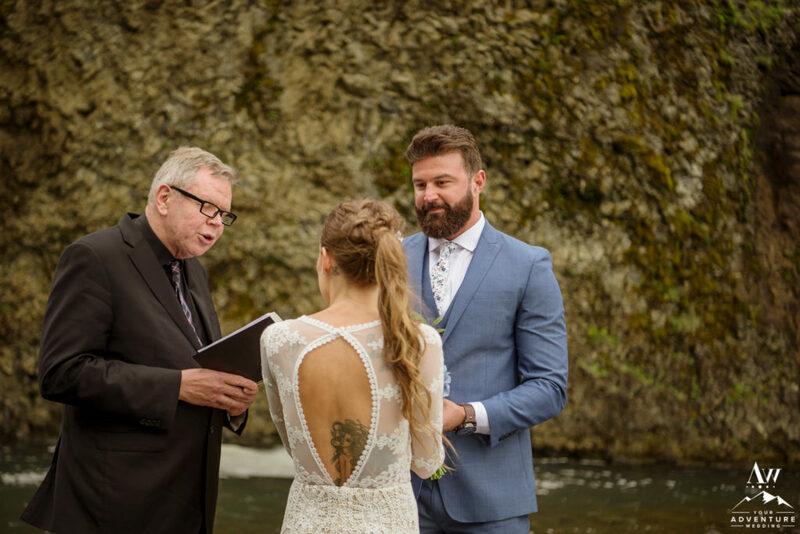 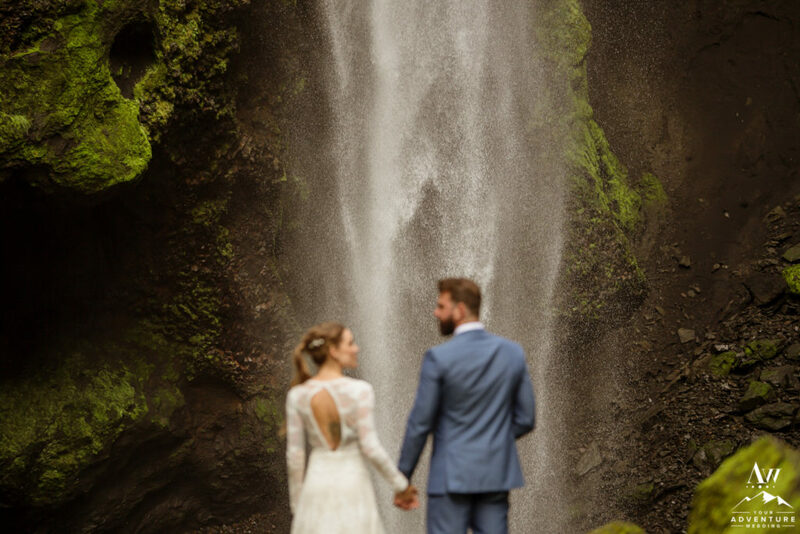 In Amanda and Chad’s initial email to us, they wanted to be married in front of a waterfall. 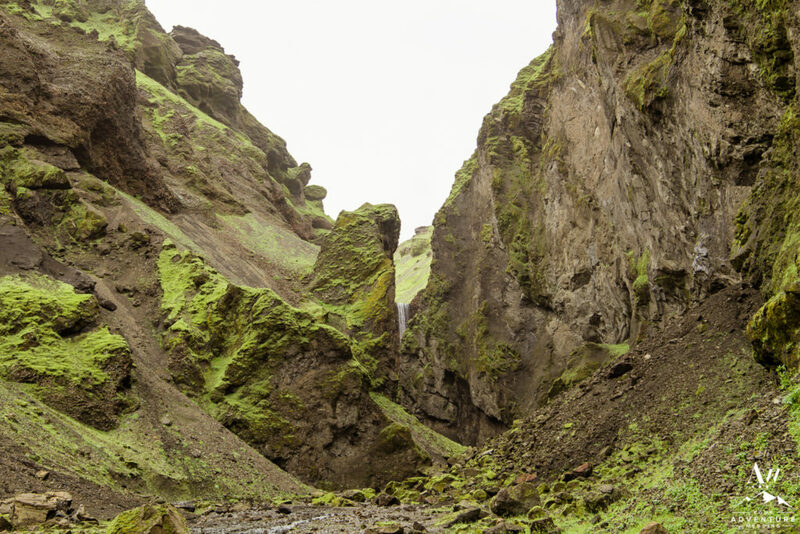 This one is a short hike from where the super jeep parks and is just so pretty! 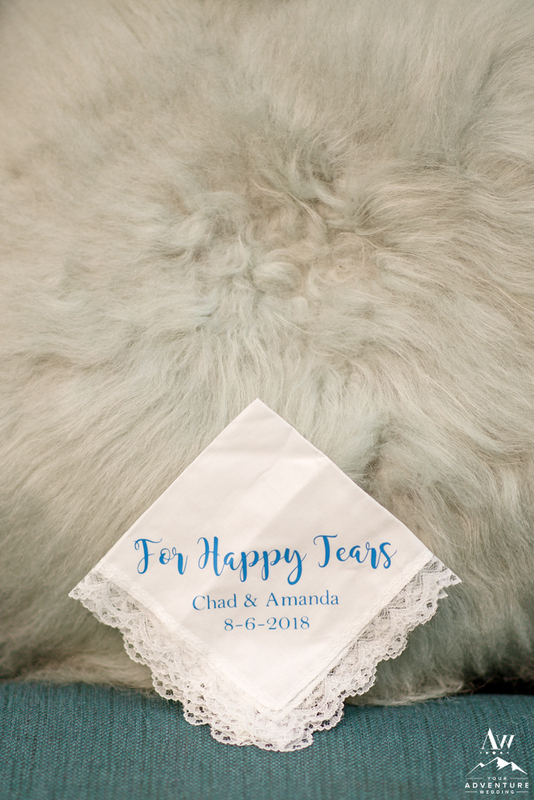 Amanda and Chad spoke their unique vows to each other and their parents bore witness. 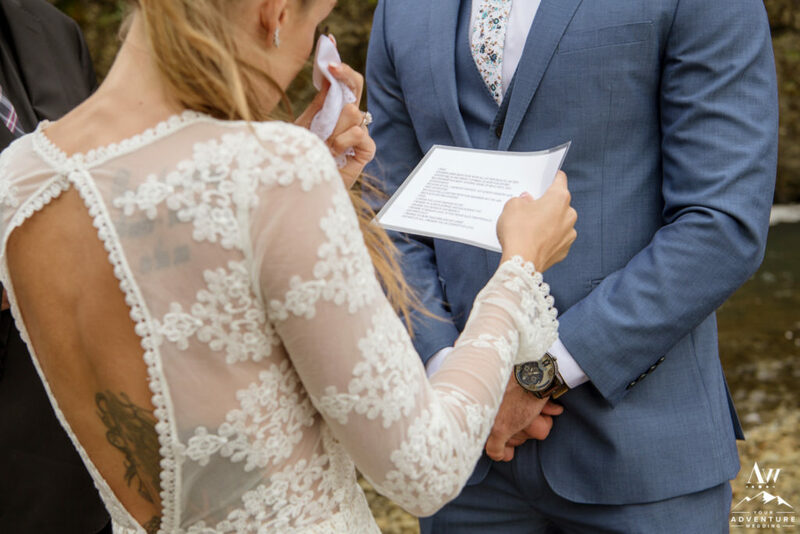 It was so intimate! 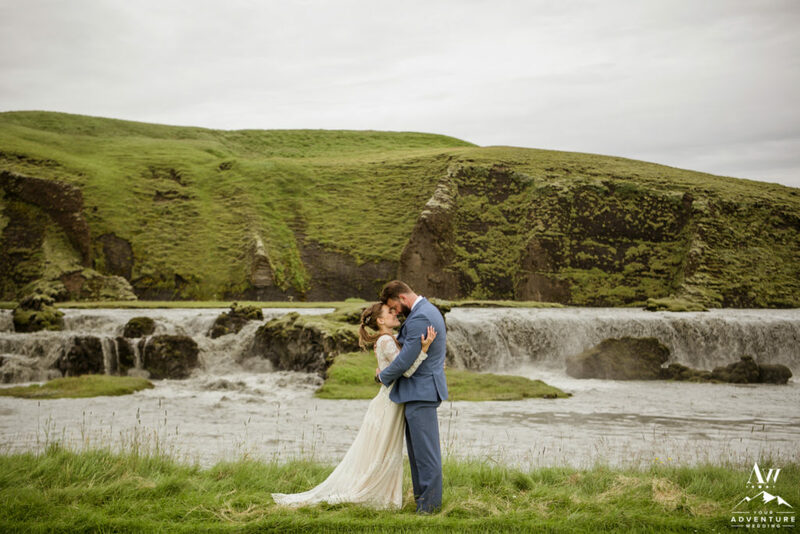 Once the ceremony concluded these two enjoyed hugs with their parents after their elopement in Vik ceremony. 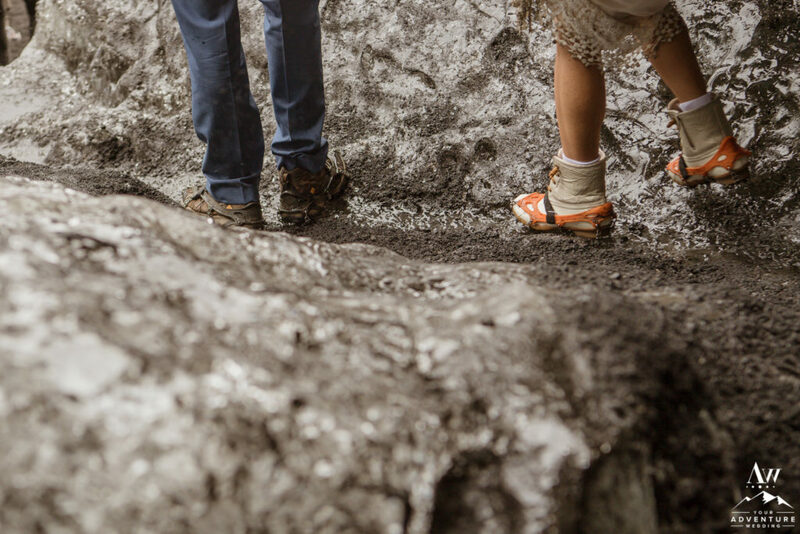 They spent some time exploring together as well. 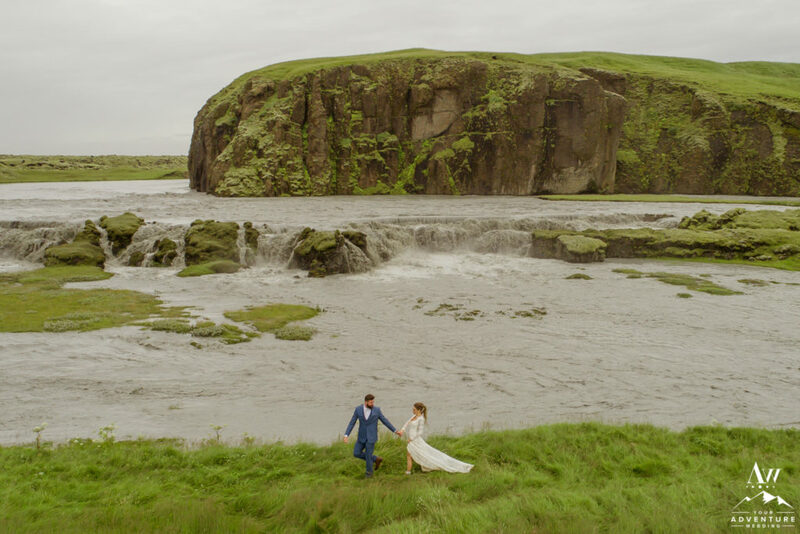 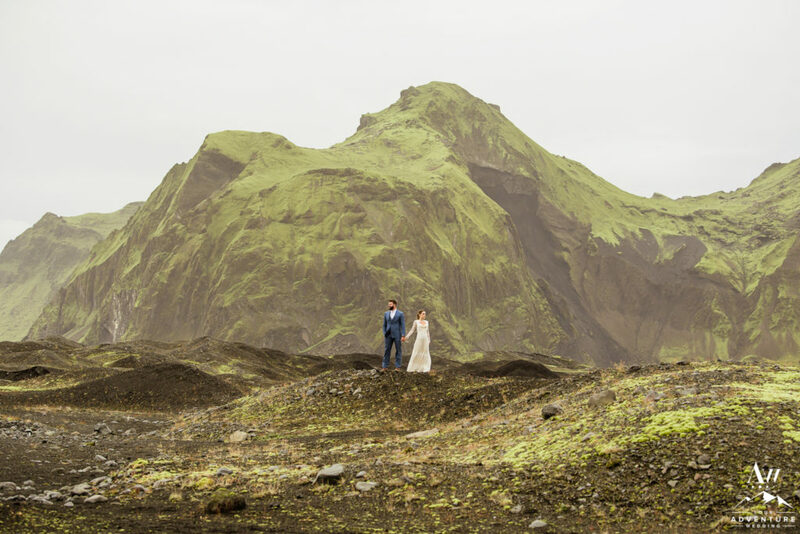 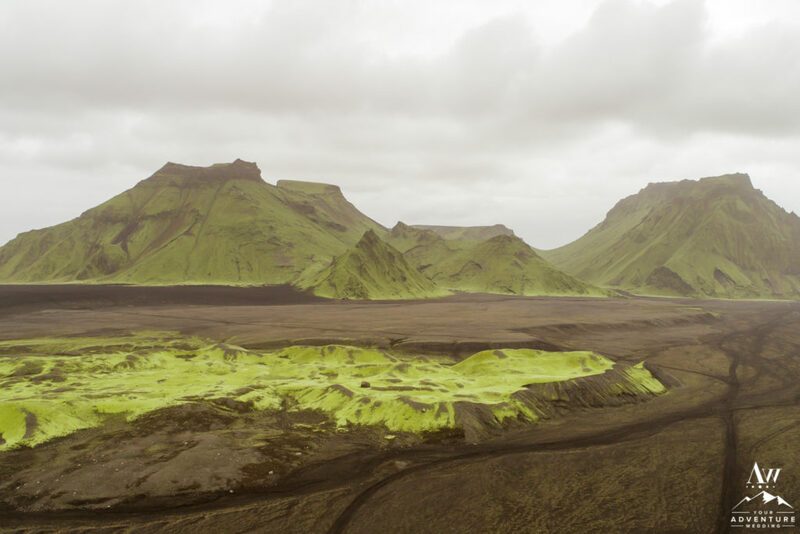 Then their Iceland wedding photographer captured some amazing moments for them on the ground and from the air. 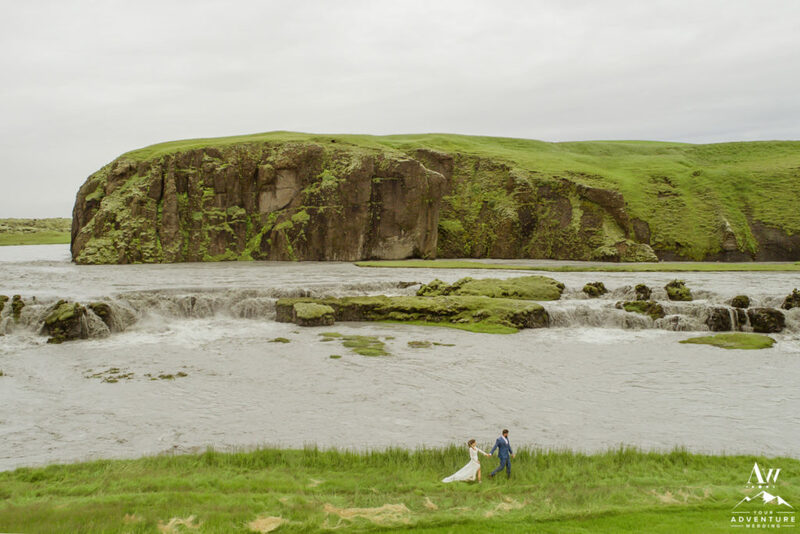 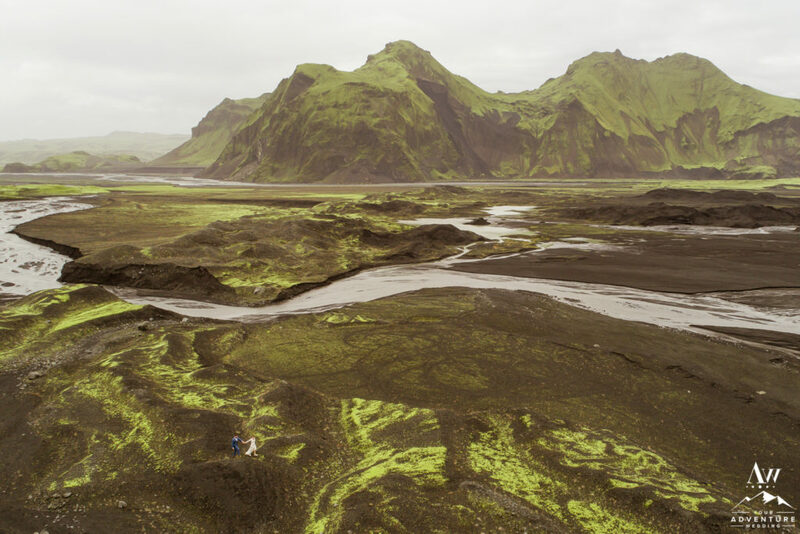 Nothing beats also having an wedding photographer who can do Iceland wedding photographer via drone! 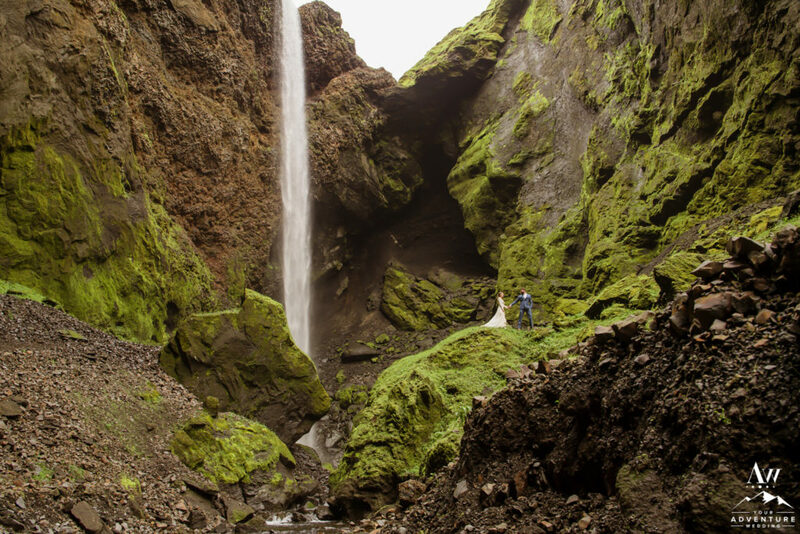 The positive thing about extreme flooding is that it can enhance the features of locations (IE make waterfalls run thicker). 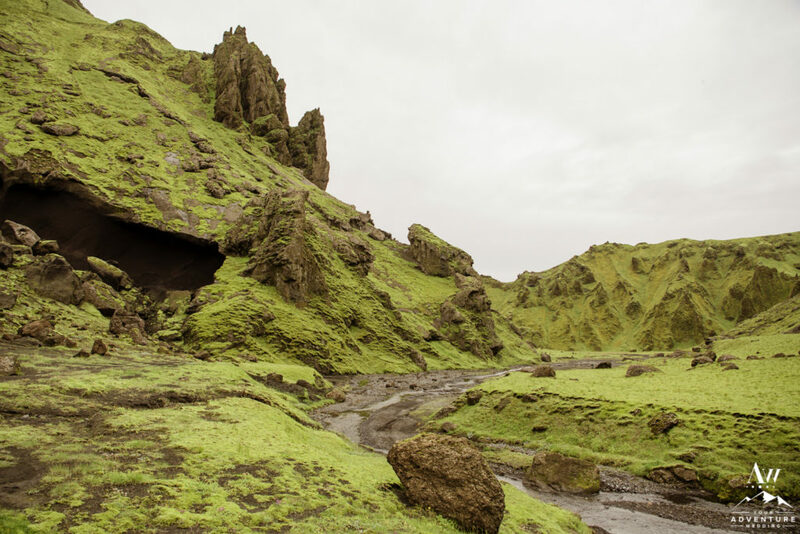 But they can also create new locations. 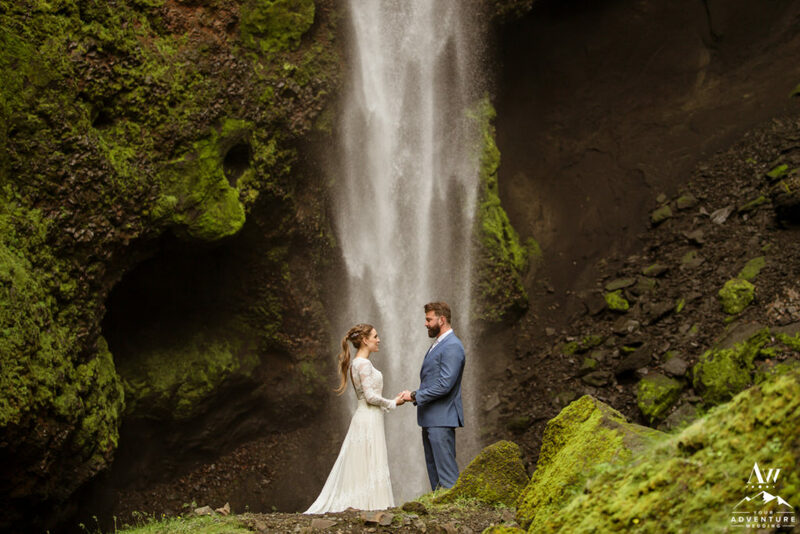 For example, our team had a feeling that a certain area may benefit from the flooding and possibly create some new waterfalls… Amanda and Chad were game to check it out and we were not disappointed! 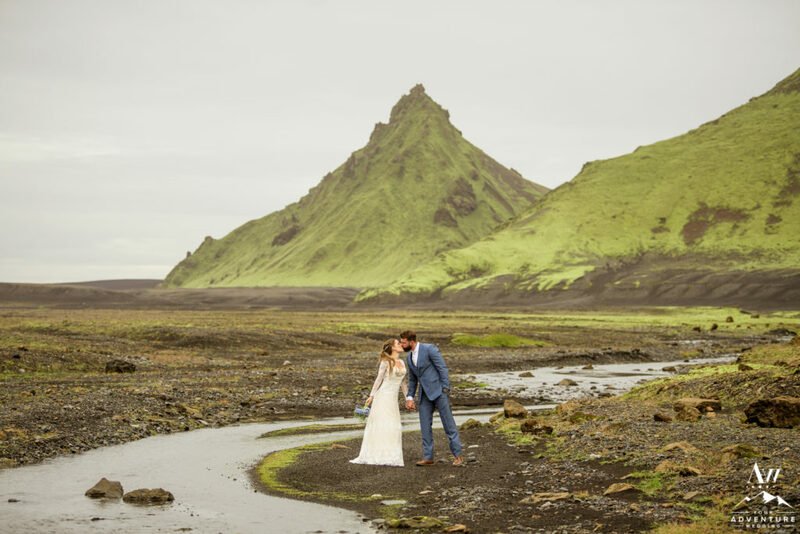 It was pretty darn incredible to witness such a unique phenomena!! 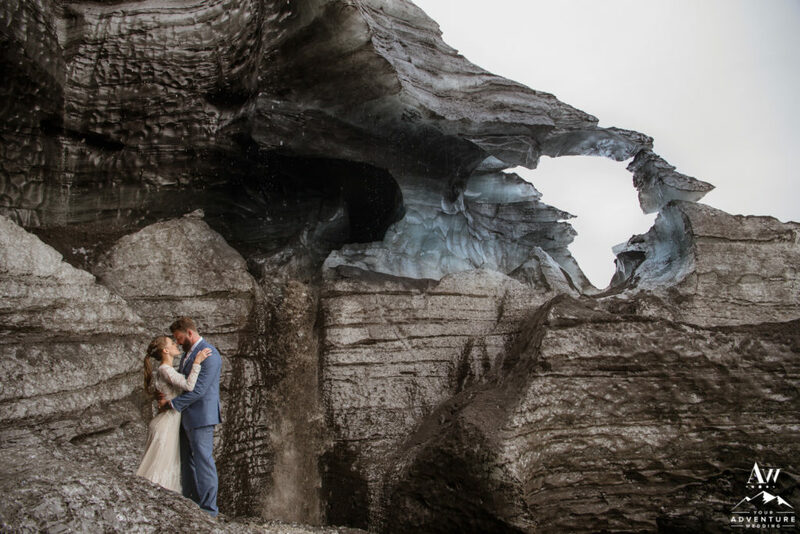 Being able to experience one of Iceland’s 13 glaciers during your elopement in Iceland is unforgettable. 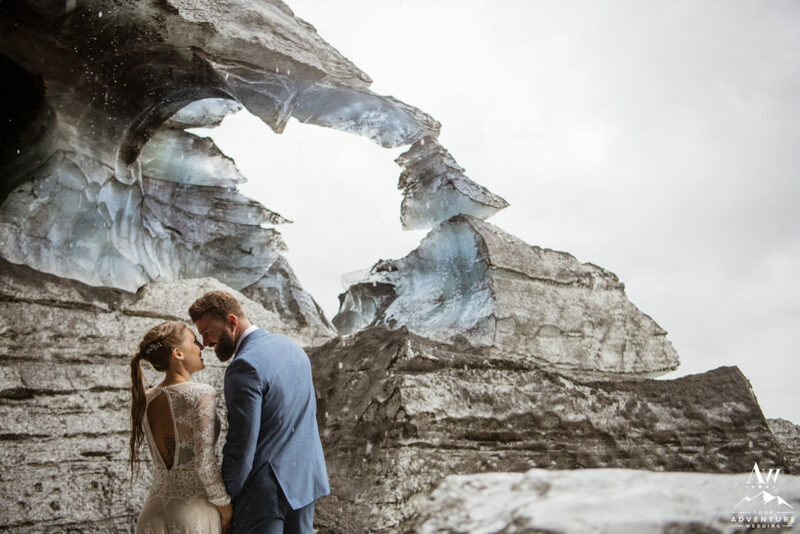 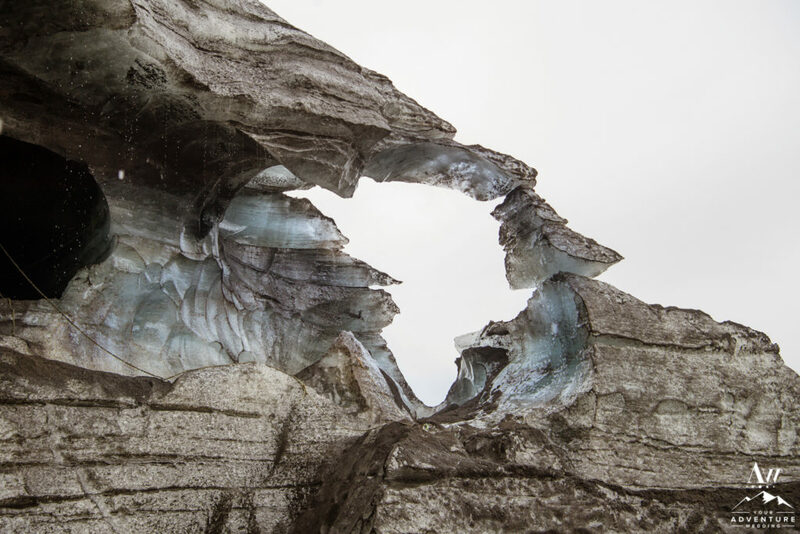 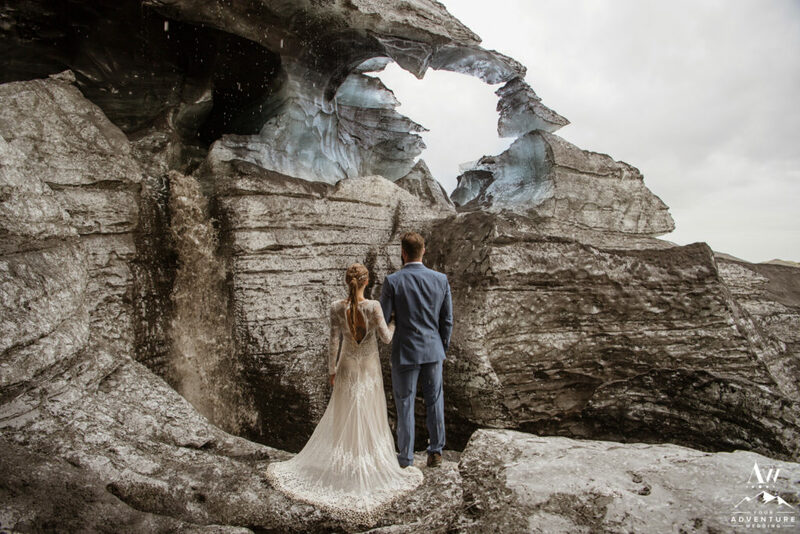 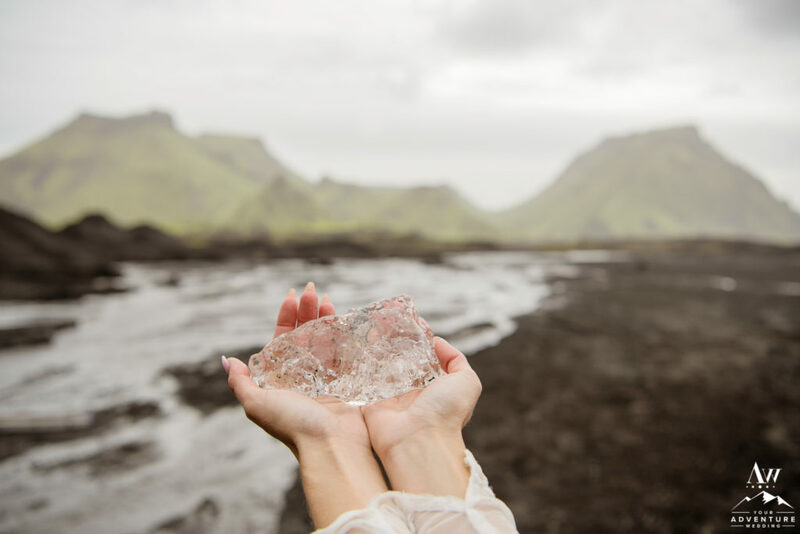 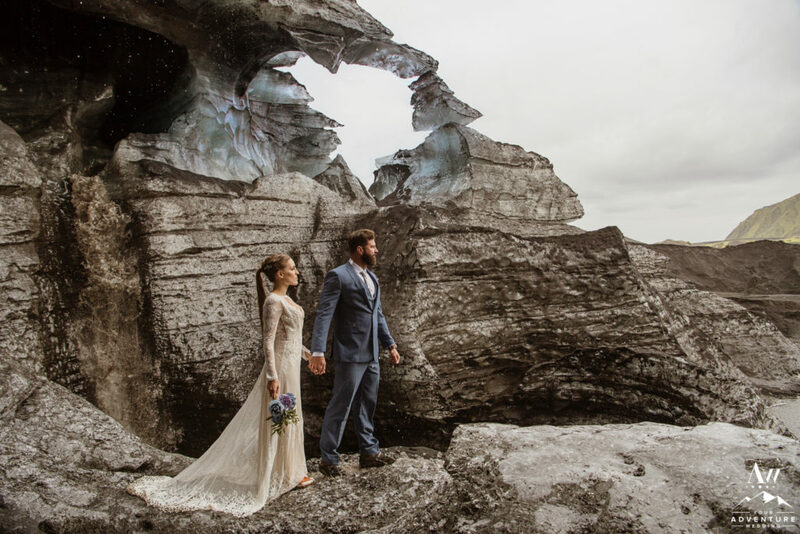 Our Iceland wedding planner team has access to a private side of a glacier where you are lucky enough to experience amazingly shaped mountains, a black glacier, and likely an ice cave! 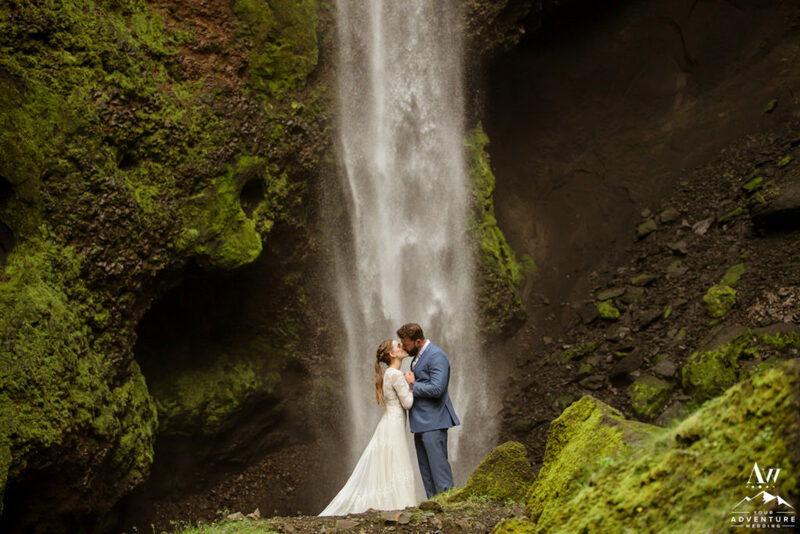 Amanda and Chad were savoring the experience by exploring all around the area, laughing, and running around hand in hand! 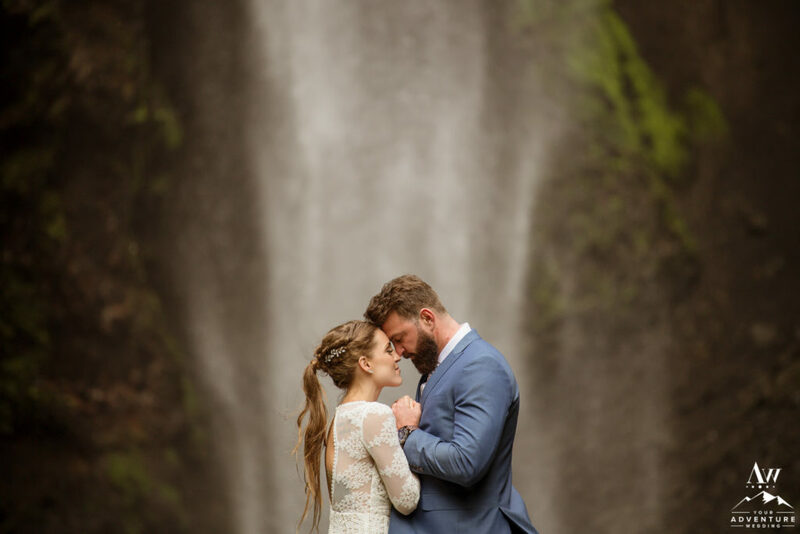 The energy and love these two exude is contagious! 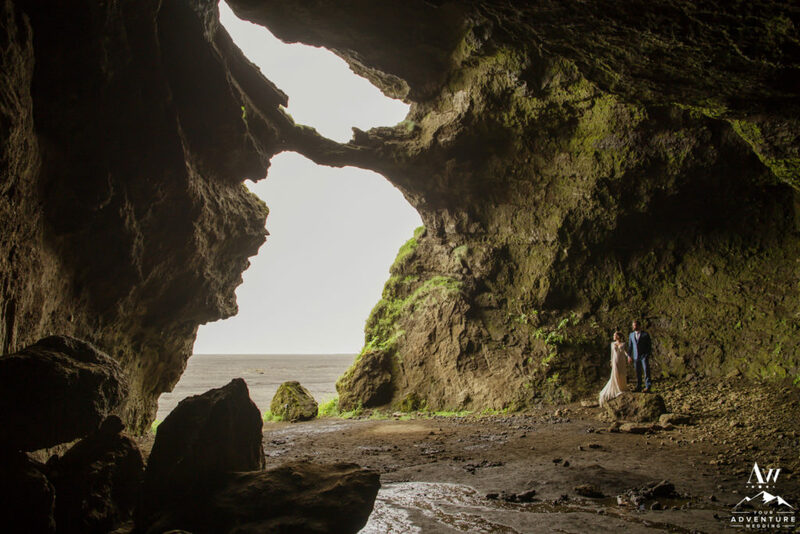 Natural caves are an easy escape from the challenging weather conditions during an adventure wedding day. 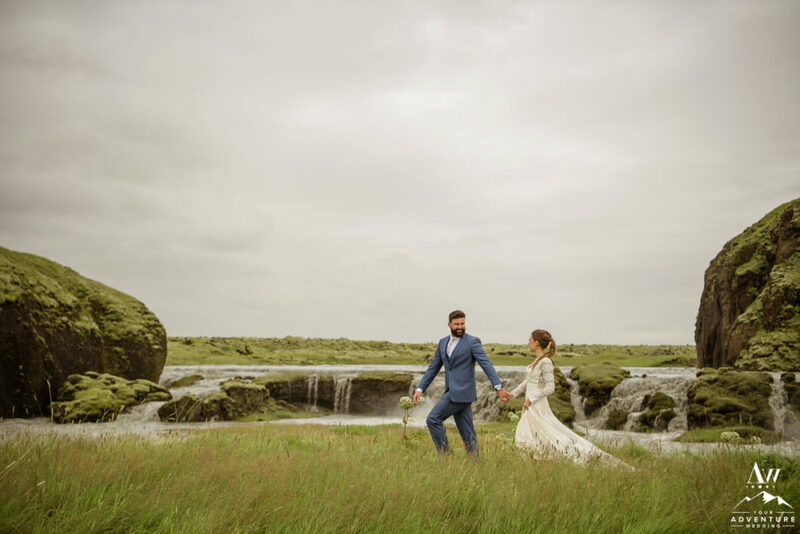 They are also really awesome to experience and have Iceland wedding photos taken in! 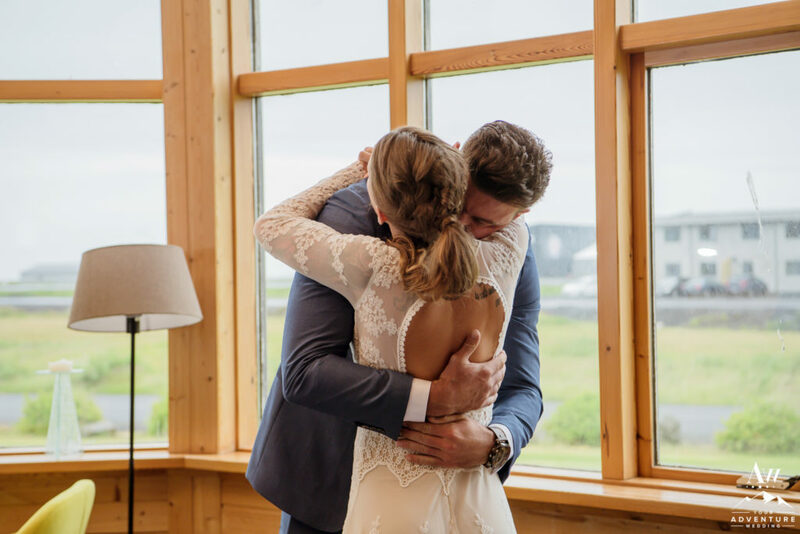 After all look at the images below and see how much these two love each other!! 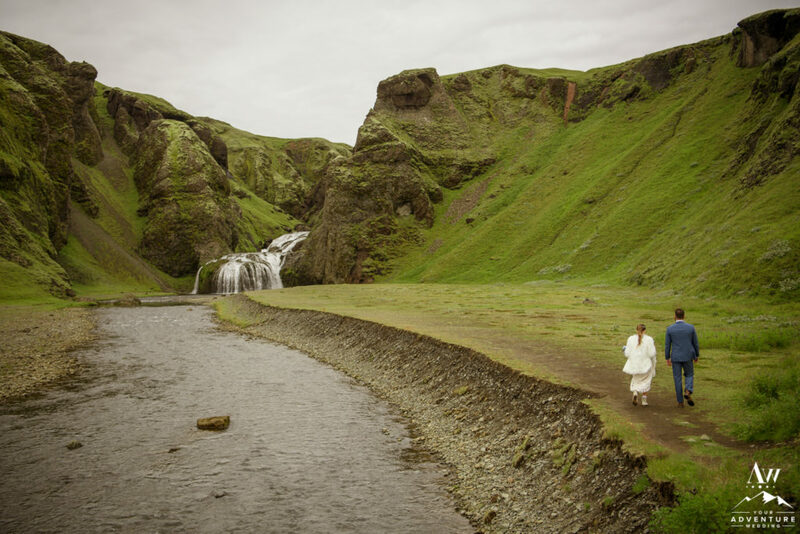 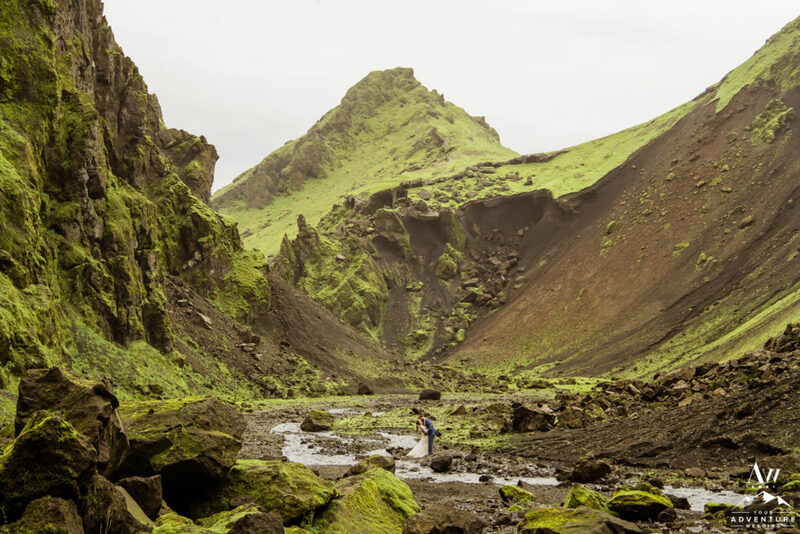 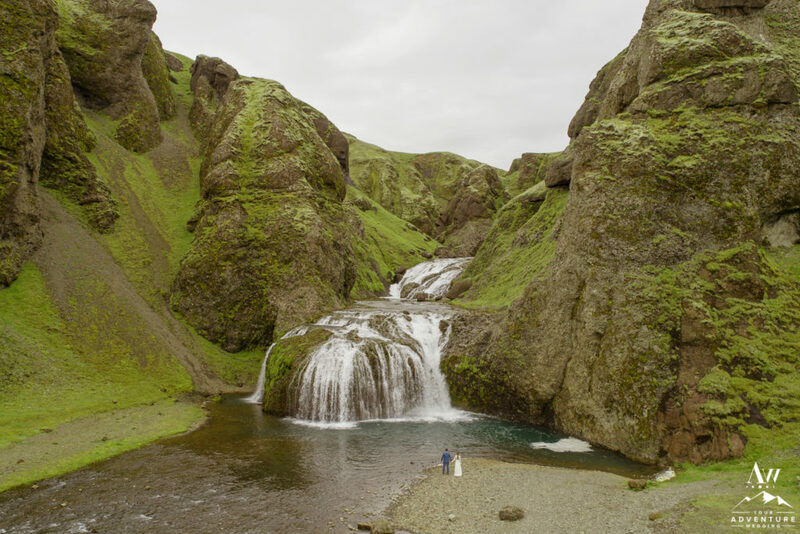 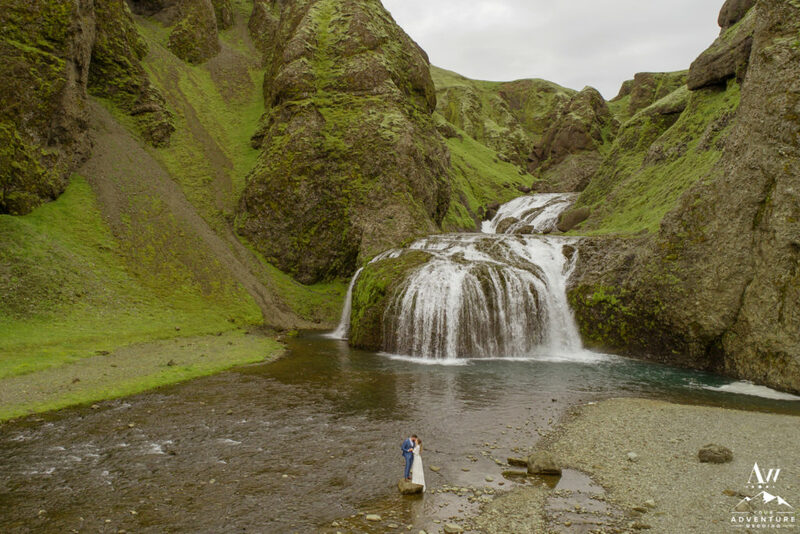 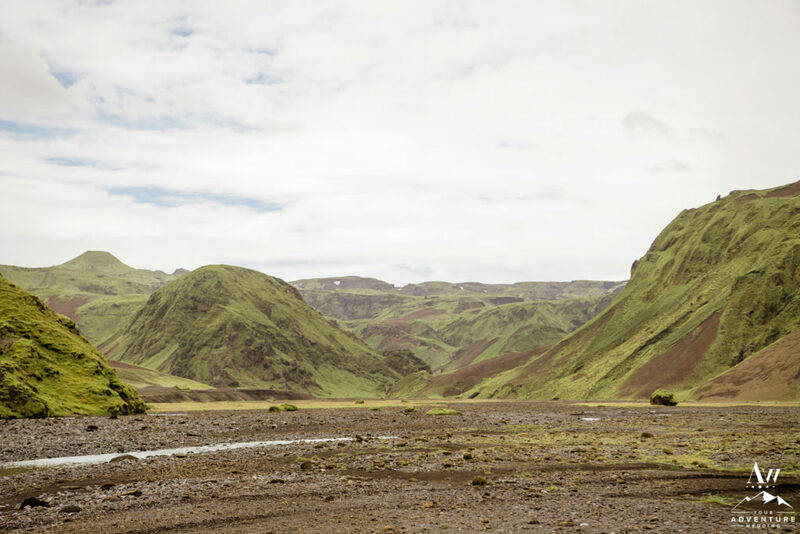 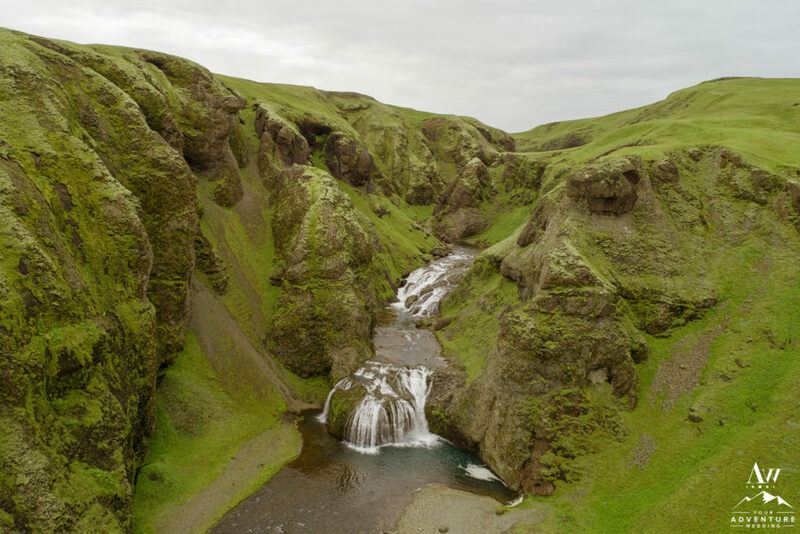 Hiking to secret waterfalls is the essence of an adventure wedding day in Iceland. 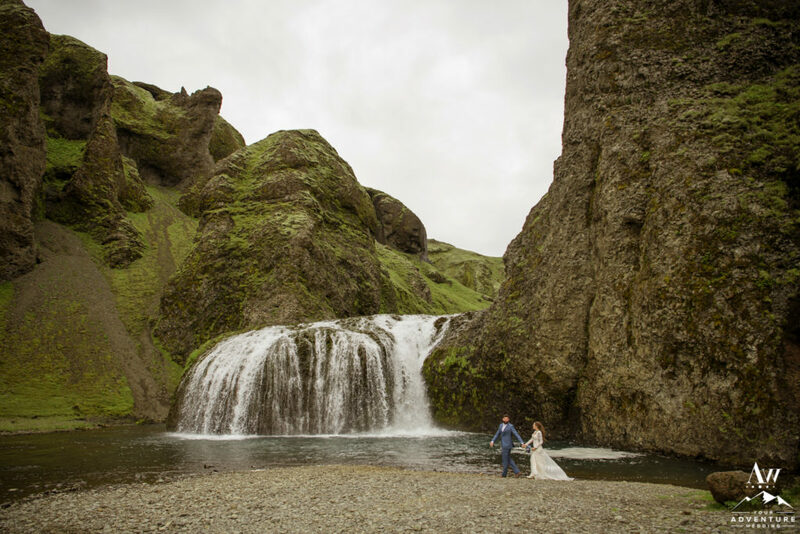 Amanda and Chad hiked with their parents to enjoy a very secret waterfall as part of their elopement in Vik! 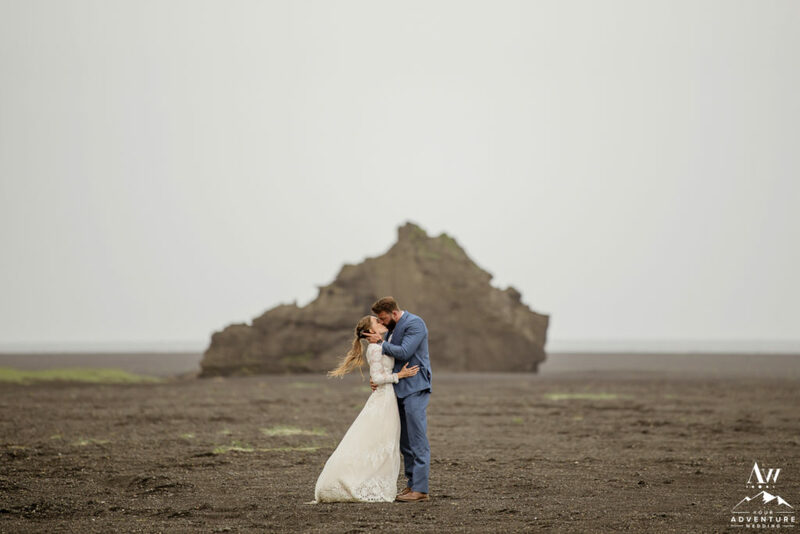 There are countless black sand (and black rock) beaches in Iceland. 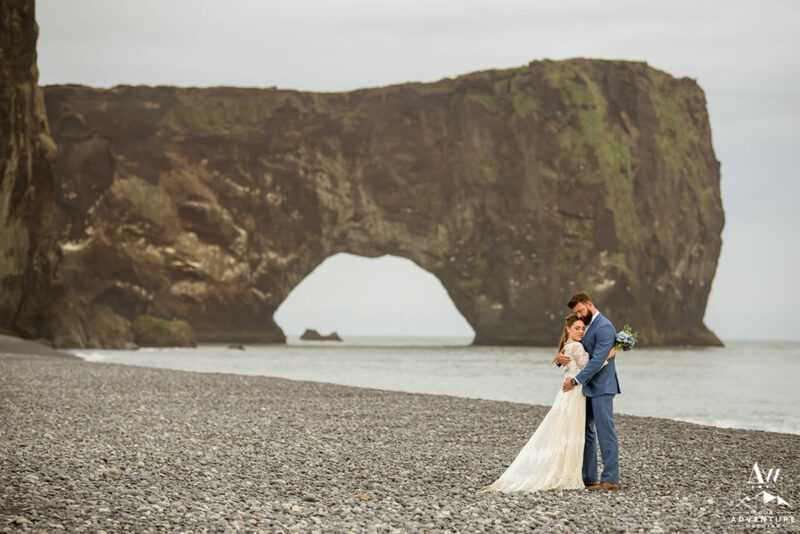 One of our personal favorites is Dyrholaey Sea Arch. 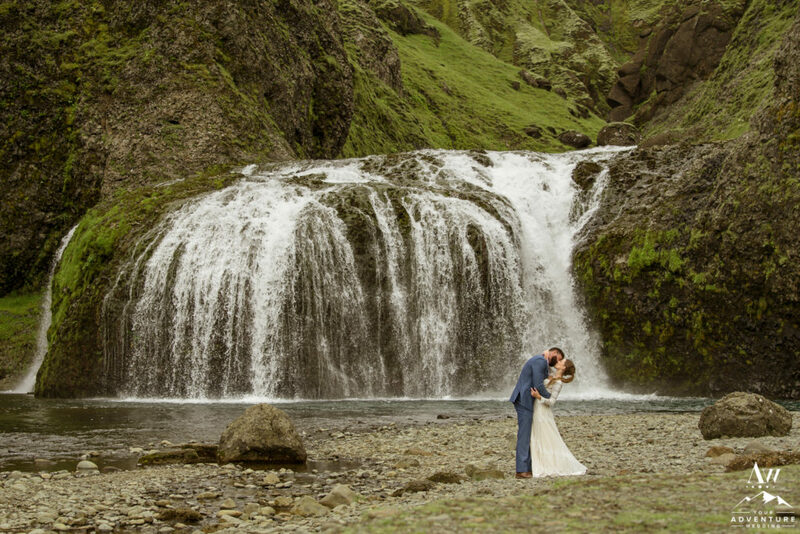 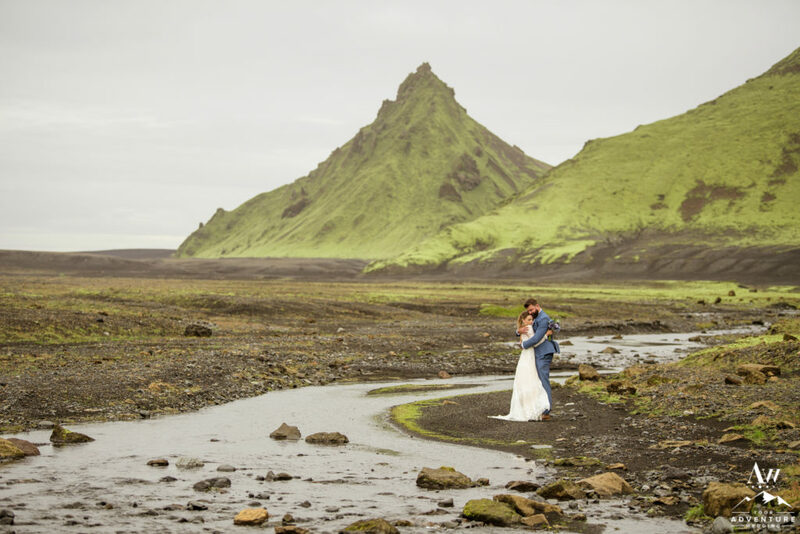 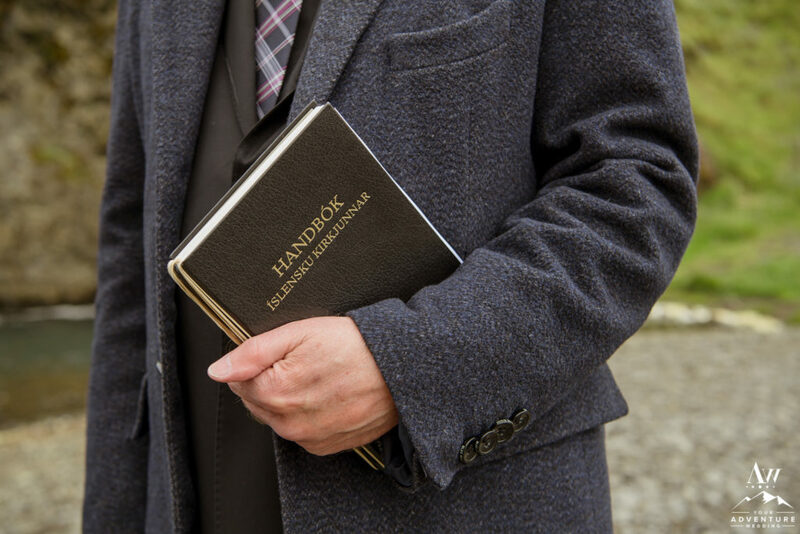 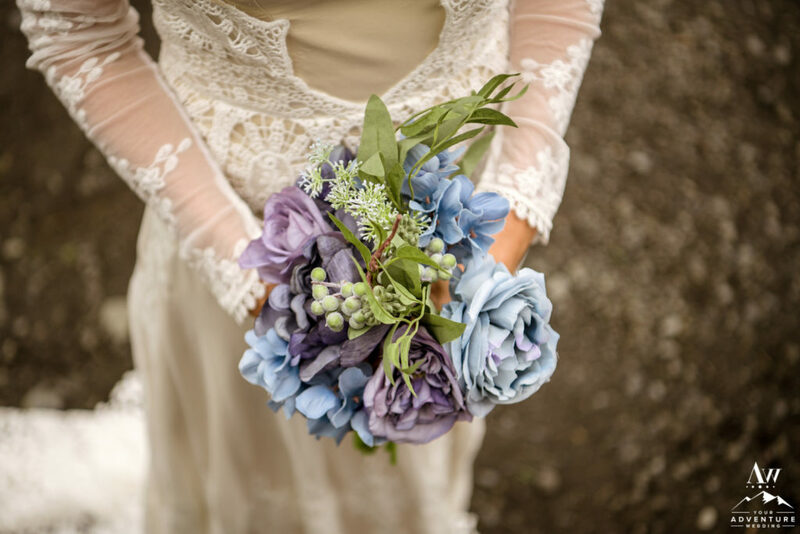 Our Iceland Wedding Planner team has access to the private side of it though making it that much more special for our clients! 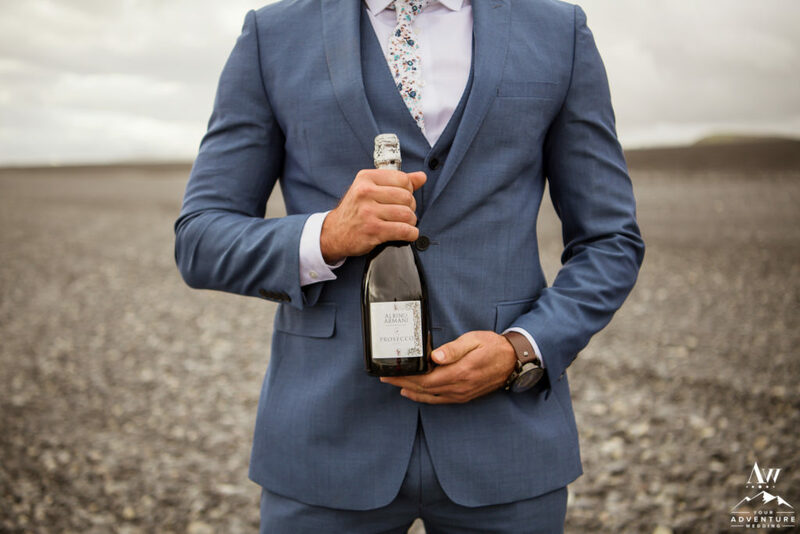 Plus who doesn’t want to frolic around on a private beach and pop a bottle of bubbles?! 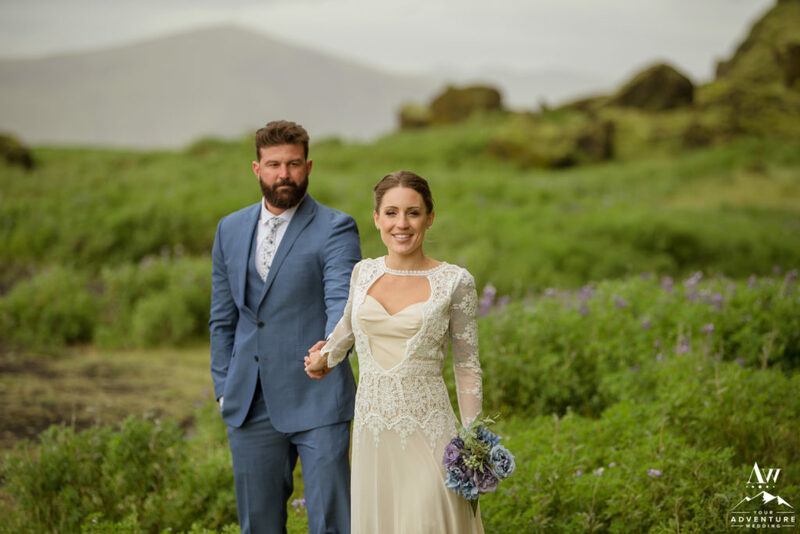 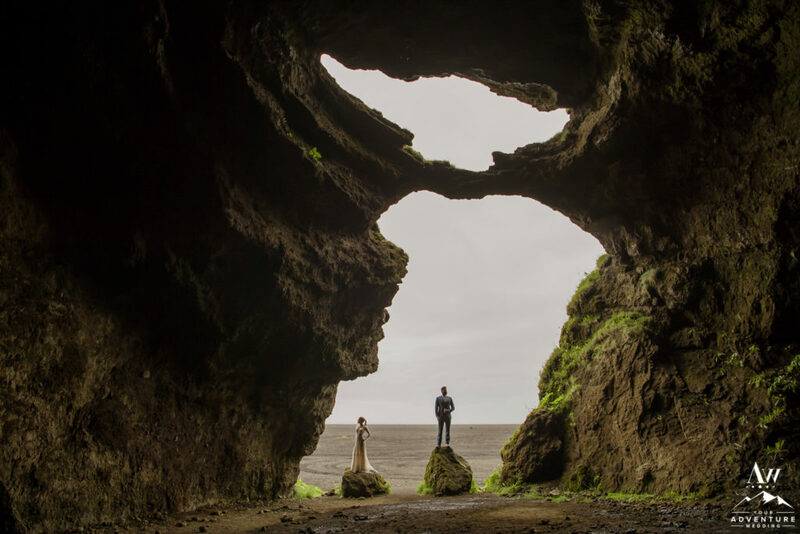 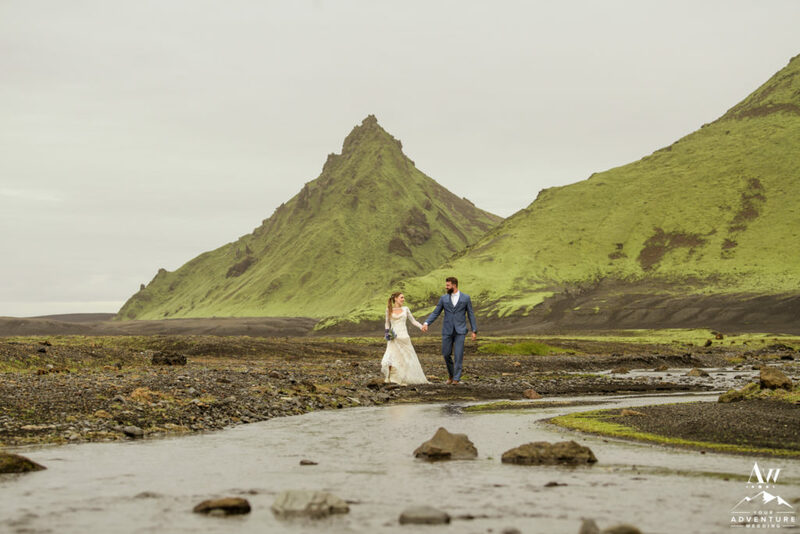 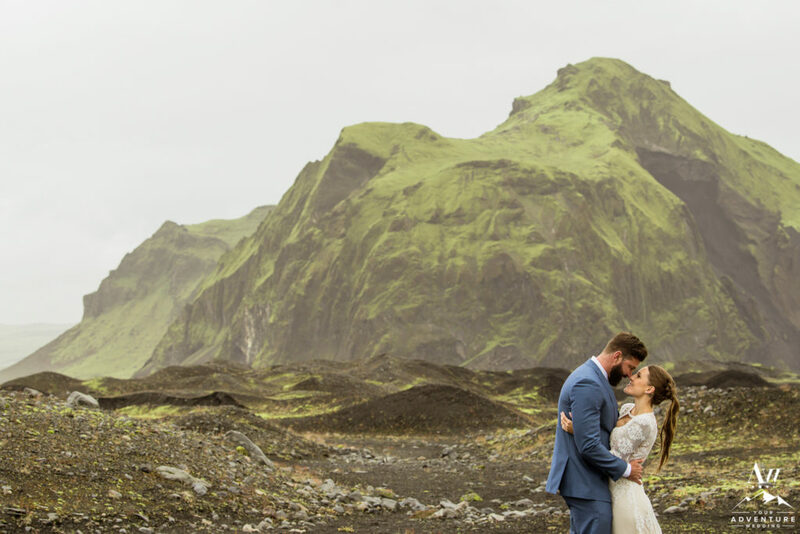 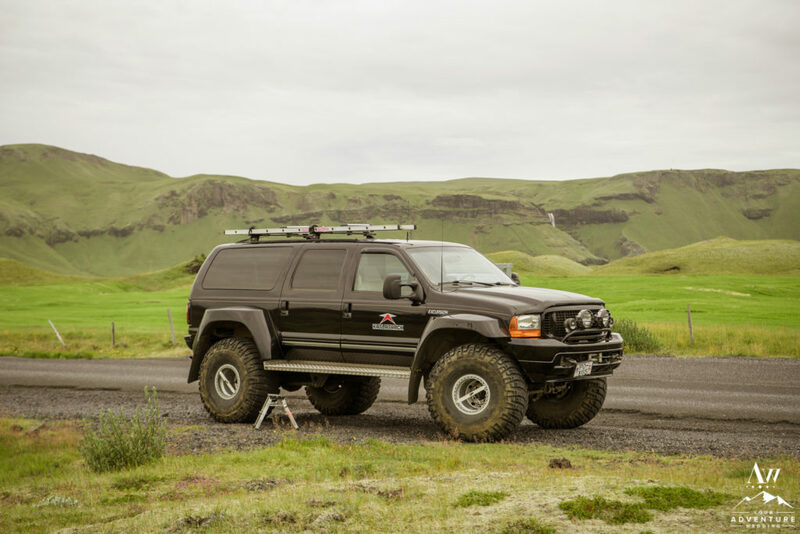 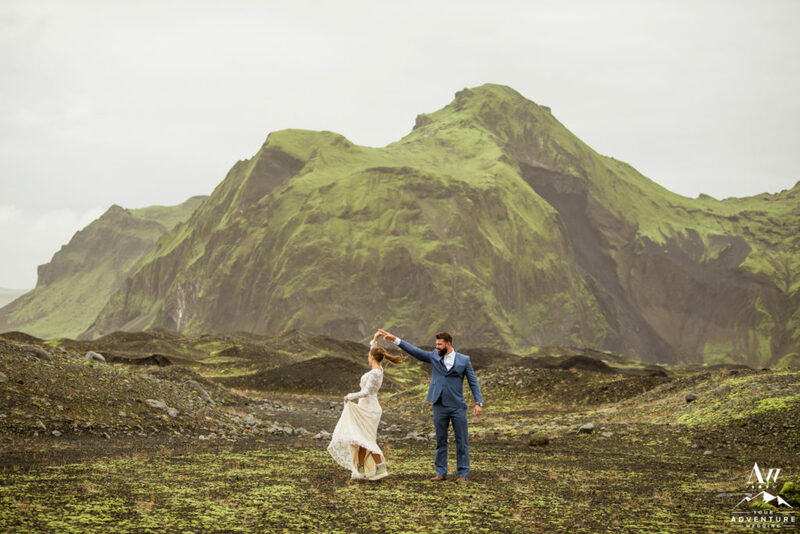 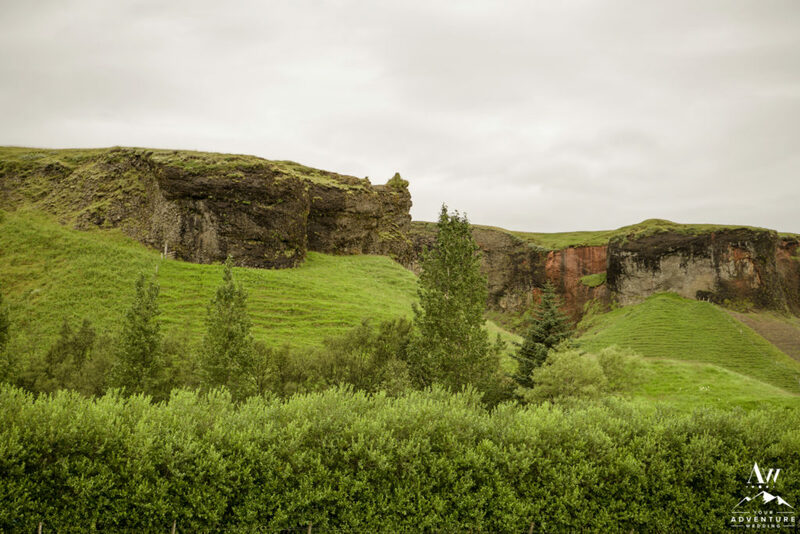 Do you love Chad and Amanda’s adventurous elopement in Vik Iceland and interested in crafting your own? 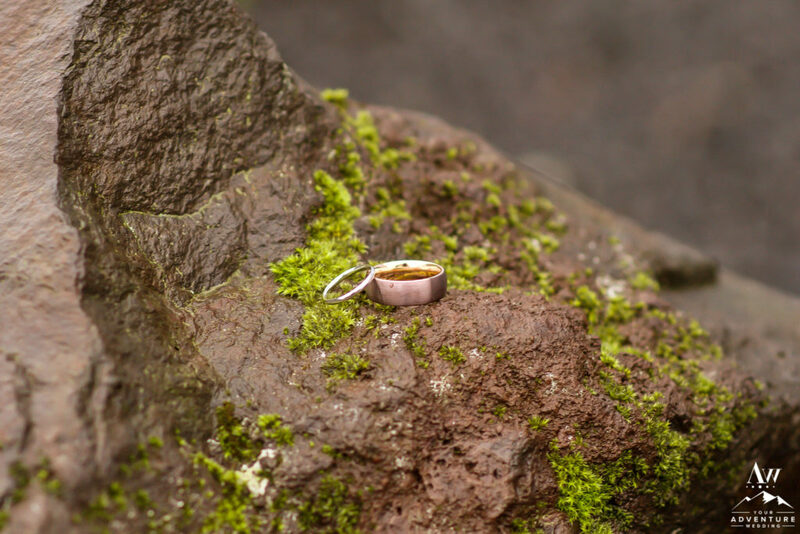 Feel free to contact us for more details on getting that amazing process started!